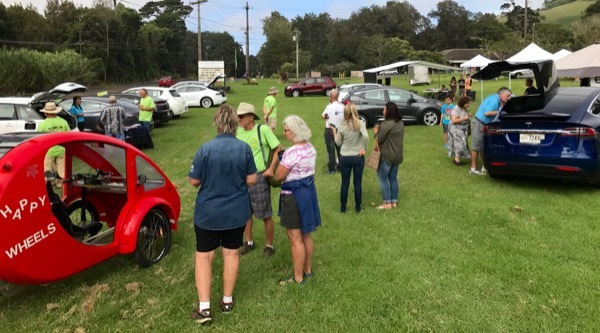 © 2017 Bent Vistisen, ElbilBy Association: permission is granted to use this photo to report, support or promote National Drive Electric Week events provided photo credit is given as shown above. All other uses prohibited unless written permission is granted by the owner. 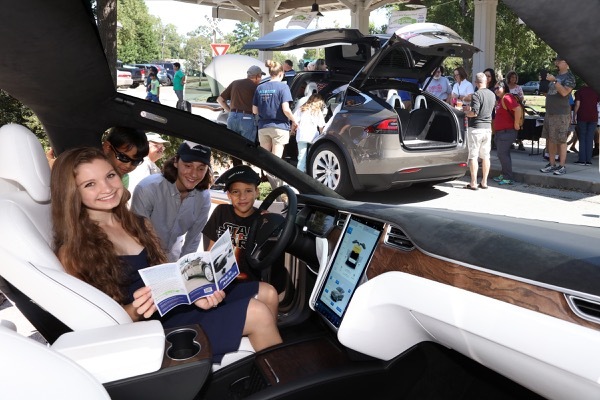 Sydney Maddox, Jacob Early, Alex Ledbetter, and Evan Early exploring a Tesla Model X. 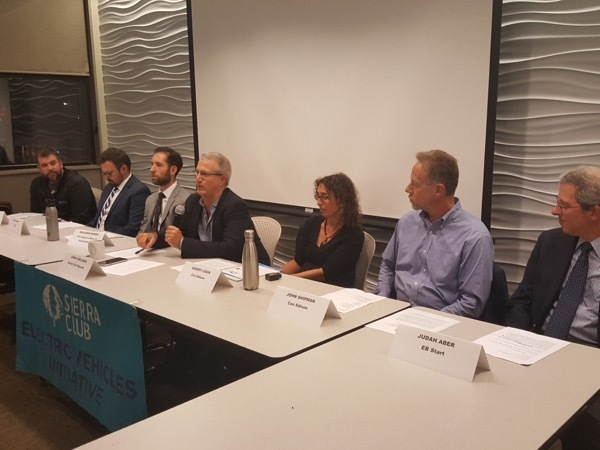 © 2017 Todd Lista: permission is granted to use this photo to report, support or promote National Drive Electric Week events provided photo credit is given as shown above. All other uses prohibited unless written permission is granted by the owner. 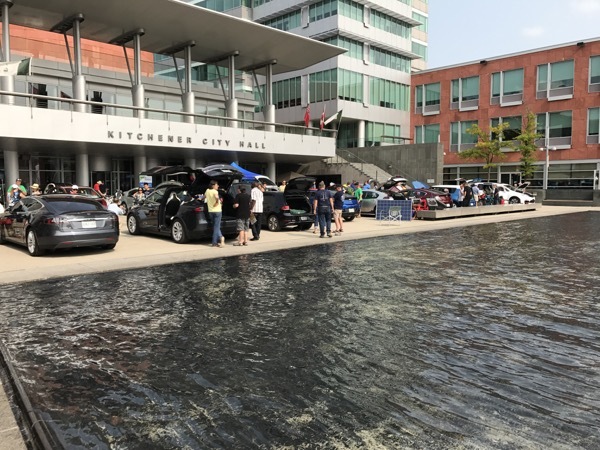 Vehicles Include: BMW i3-REX Nissan Leaf (x2) Tesla Model S (x2) Chevrolet Volt (x4) Ford C-Max Energi Hyundai Sonata PHEV Fiat 500e Assorted electric assist bikes. 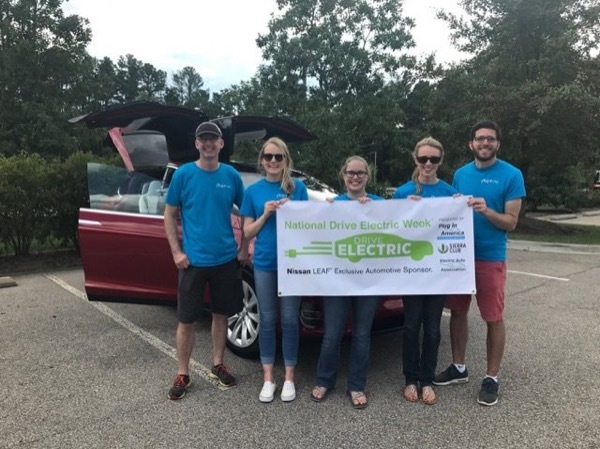 © 2017 Adam Shands: permission is granted to use this photo to report, support or promote National Drive Electric Week events provided photo credit is given as shown above. All other uses prohibited unless written permission is granted by the owner. 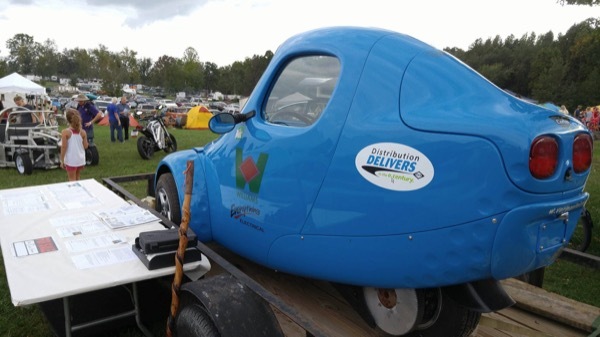 A custom Corbin Sparrow is displayed for the EV Showcase at the 2017 Ohio Pawpaw Festival (Lake Snowden, Albany, Ohio). 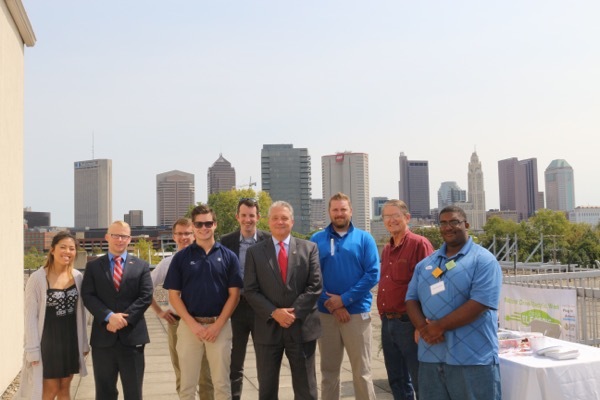 © 2017 UpGrade Ohio: permission is granted to use this photo to report, support or promote National Drive Electric Week events provided photo credit is given as shown above. All other uses prohibited unless written permission is granted by the owner. Sara Stratton, Anthony Kozlowski, Emma Van Moorsel are the people present in the pictures. 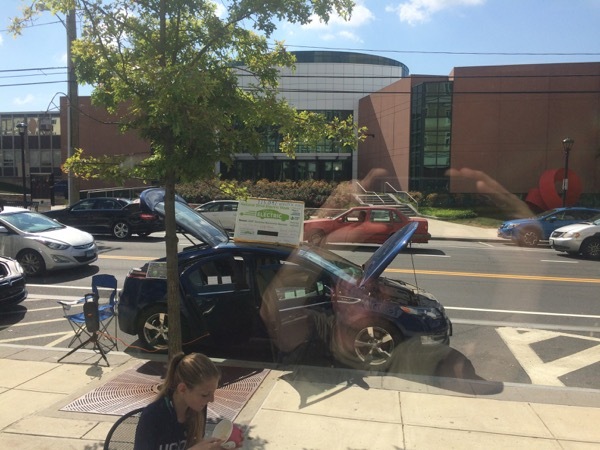 There is a Ford Fusion, Chevy Volt, and BMW i3 in the picture. The picture was taken at the NM State Fair. © 2017 PNM: permission is granted to use this photo to report, support or promote National Drive Electric Week events provided photo credit is given as shown above. All other uses prohibited unless written permission is granted by the owner. © 2017 Chris Campbell: permission is granted to use this photo to report, support or promote National Drive Electric Week events provided photo credit is given as shown above. All other uses prohibited unless written permission is granted by the owner. © 2017 Andrew Breiter-Wu: permission is granted to use this photo to report, support or promote National Drive Electric Week events provided photo credit is given as shown above. All other uses prohibited unless written permission is granted by the owner. 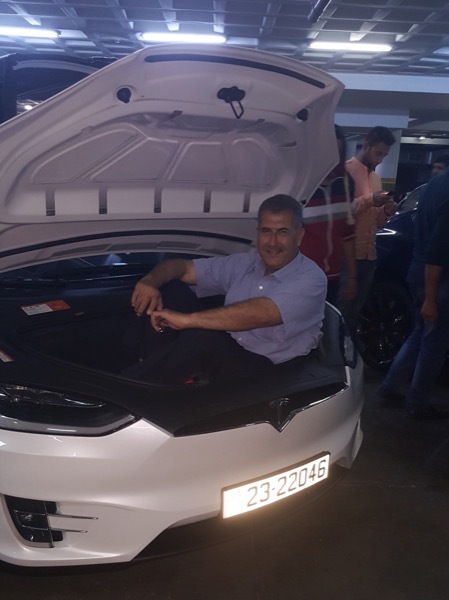 Attendees at Jordan's first-ever Drive Electric Week event learned that the faux trunk (frunk) of a Tesla Model S is roomy enough to hold a person! © 2017 Amjad Daoud / ACM JORDAN ISWSA: permission is granted to use this photo to report, support or promote National Drive Electric Week events provided photo credit is given as shown above. All other uses prohibited unless written permission is granted by the owner. © 2017 Alan Spector: permission is granted to use this photo to report, support or promote National Drive Electric Week events provided photo credit is given as shown above. All other uses prohibited unless written permission is granted by the owner. 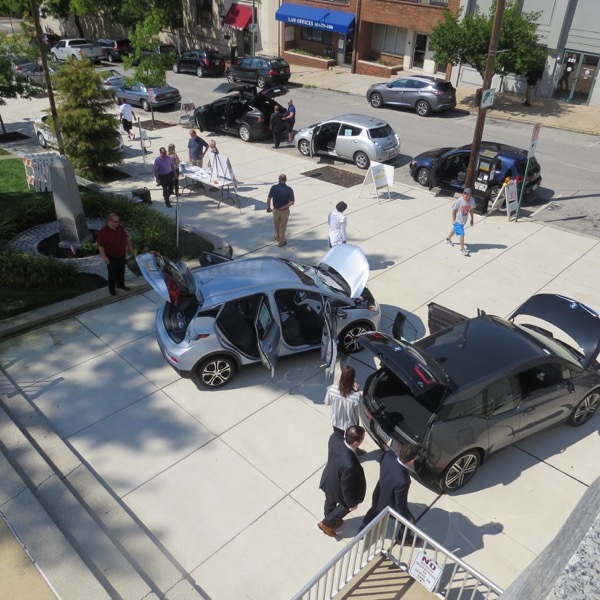 A vintage automobile from the early 1900s happened to pass by our EV Showcase in this photo taken from the State House, emphasizing our theme of the Future Meets History in Annapolis. 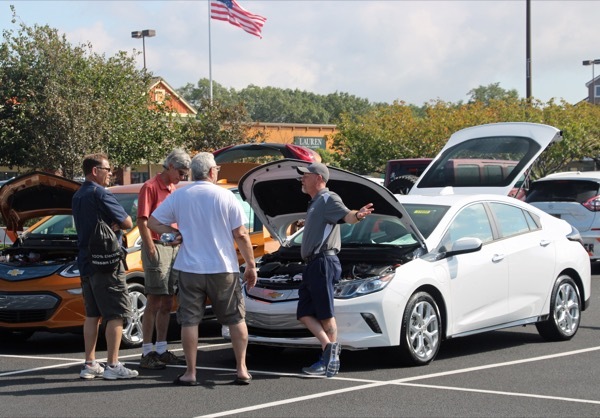 © 2017 Scott Wilson, EVADC: permission is granted to use this photo to report, support or promote National Drive Electric Week events provided photo credit is given as shown above. All other uses prohibited unless written permission is granted by the owner. 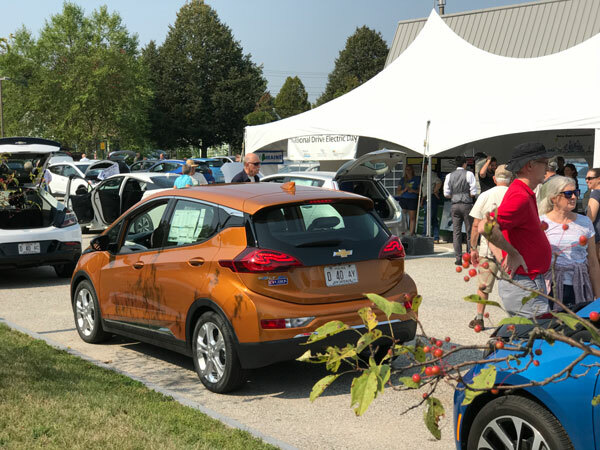 © 2017 Paul Pancella, Michigan Electric Auto Association: permission is granted to use this photo to report, support or promote National Drive Electric Week events provided photo credit is given as shown above. All other uses prohibited unless written permission is granted by the owner. © 2017 Jeff Theisen: permission is granted to use this photo to report, support or promote National Drive Electric Week events provided photo credit is given as shown above. All other uses prohibited unless written permission is granted by the owner. 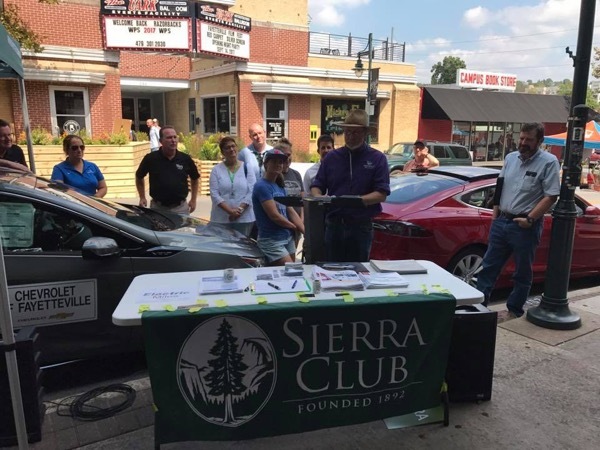 © 2017 Kelsey Crane, Sierra Club: permission is granted to use this photo to report, support or promote National Drive Electric Week events provided photo credit is given as shown above. All other uses prohibited unless written permission is granted by the owner. A collage of some photos from the event. 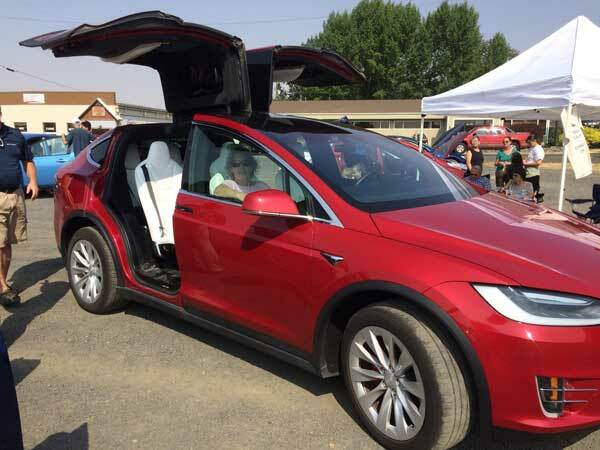 In the picture there is a Model X with a solarized camper, a Bolt, Roadster and an electric bicycle. Also shown is a Leaf charging from an off grid solar system. 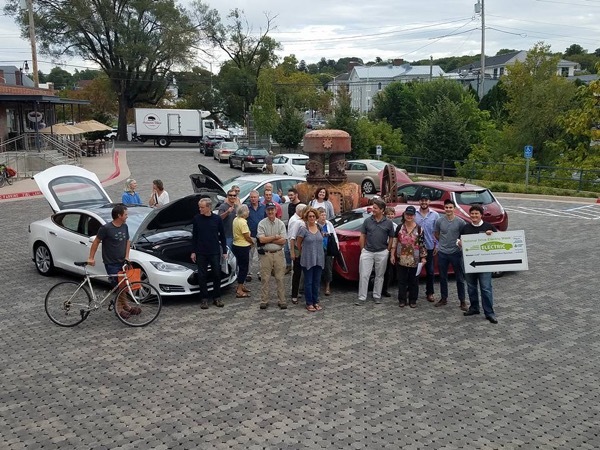 © 2017 Blue Ridge EV Club: permission is granted to use this photo to report, support or promote National Drive Electric Week events provided photo credit is given as shown above. All other uses prohibited unless written permission is granted by the owner. 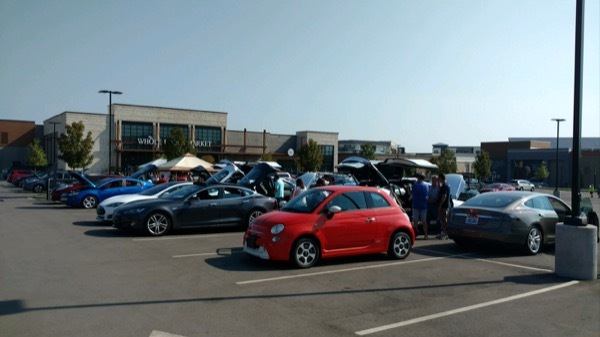 Members and supporters of Village Bakery's (Athens, OH) new EV charger installation and the local EV Cruisers electric car club. 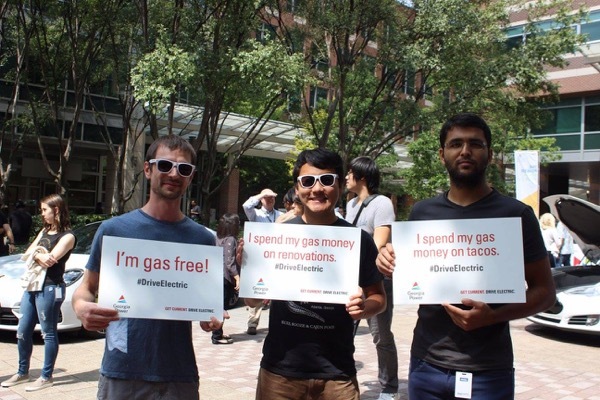 Three National Drive Electric Week attendees at Tech Square in Atlanta show why they drive electric. © 2017 Southern Company/Georgia Power: permission is granted to use this photo to report, support or promote National Drive Electric Week events provided photo credit is given as shown above. All other uses prohibited unless written permission is granted by the owner. © 2017 Monica Coffey: permission is granted to use this photo to report, support or promote National Drive Electric Week events provided photo credit is given as shown above. All other uses prohibited unless written permission is granted by the owner. © 2017 Jill Sorensen: permission is granted to use this photo to report, support or promote National Drive Electric Week events provided photo credit is given as shown above. All other uses prohibited unless written permission is granted by the owner. 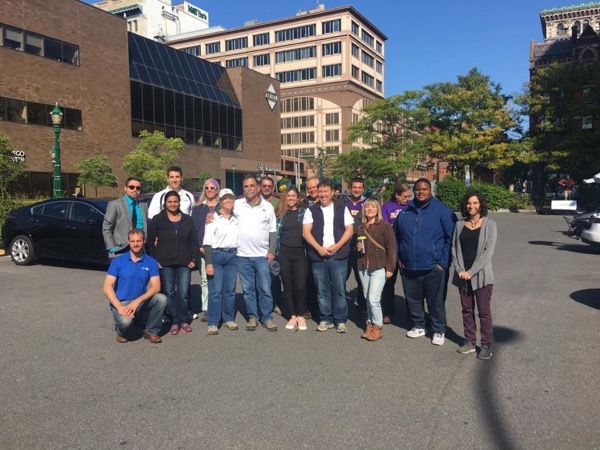 The Simcoe County Electric Vehicle Association volunteers for the 2017 NDEW event in Barrie, Ontario! 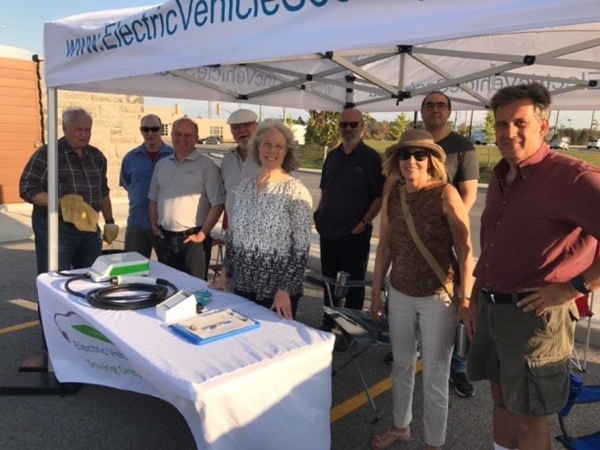 © 2017 Simcoe County Electric Vehicle Association: permission is granted to use this photo to report, support or promote National Drive Electric Week events provided photo credit is given as shown above. All other uses prohibited unless written permission is granted by the owner. 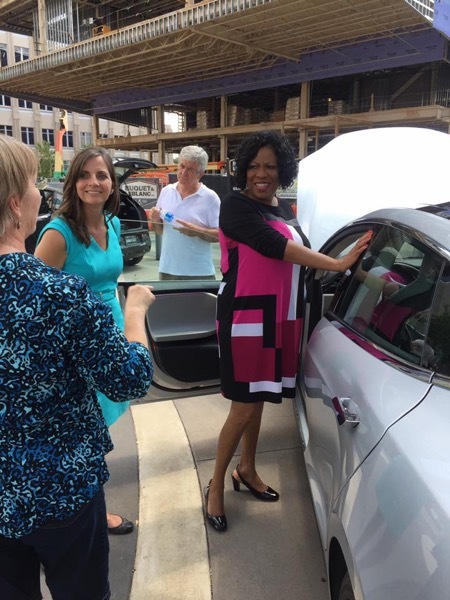 © 2017 East Baton Rouge Mayor's staff / Mayor Broome: permission is granted to use this photo to report, support or promote National Drive Electric Week events provided photo credit is given as shown above. All other uses prohibited unless written permission is granted by the owner. 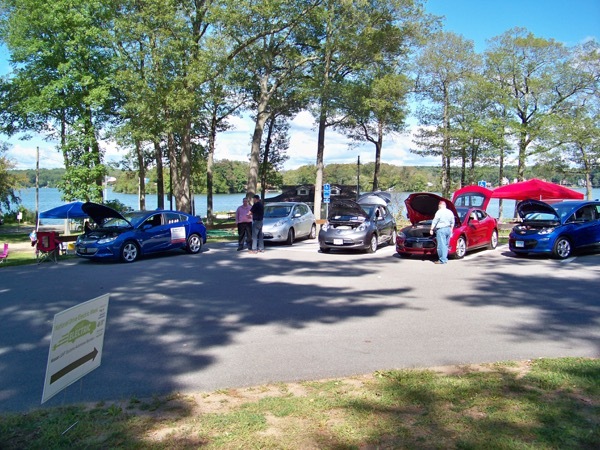 © 2017 NYS Parks, Recreation and Historic Preservation: permission is granted to use this photo to report, support or promote National Drive Electric Week events provided photo credit is given as shown above. All other uses prohibited unless written permission is granted by the owner. 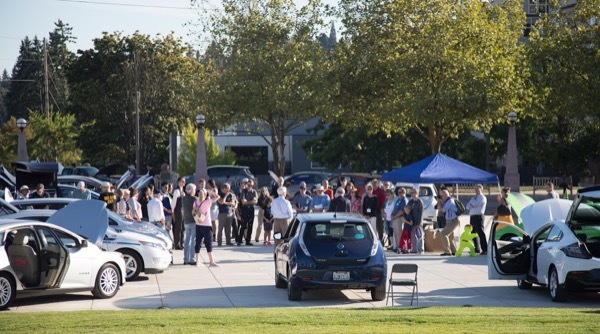 Attendees listening to Bellevue Mayor John Stokes talk about the City's support for plug-in electric vehicles. © 2017 Tom Saxton: permission is granted to use this photo to report, support or promote National Drive Electric Week events provided photo credit is given as shown above. All other uses prohibited unless written permission is granted by the owner. © 2017 Jesse Rudavsky: permission is granted to use this photo to report, support or promote National Drive Electric Week events provided photo credit is given as shown above. All other uses prohibited unless written permission is granted by the owner. Don't know the people in the photo. 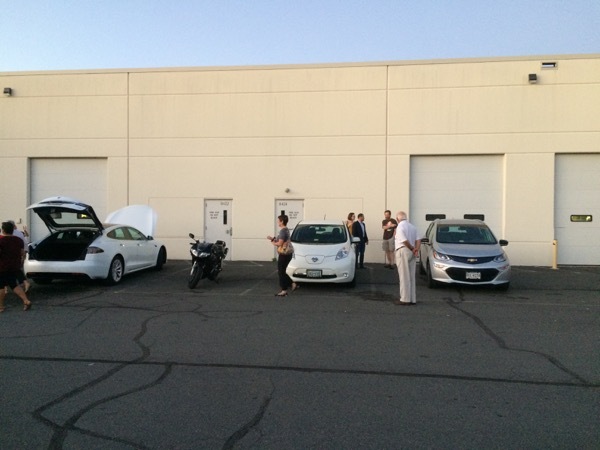 Vehicles are Nissan Leaf, Zero FXS Motorcycle, Chevy Bolt, and another Nissan Leaf. © 2017 Henry Abel: permission is granted to use this photo to report, support or promote National Drive Electric Week events provided photo credit is given as shown above. All other uses prohibited unless written permission is granted by the owner. 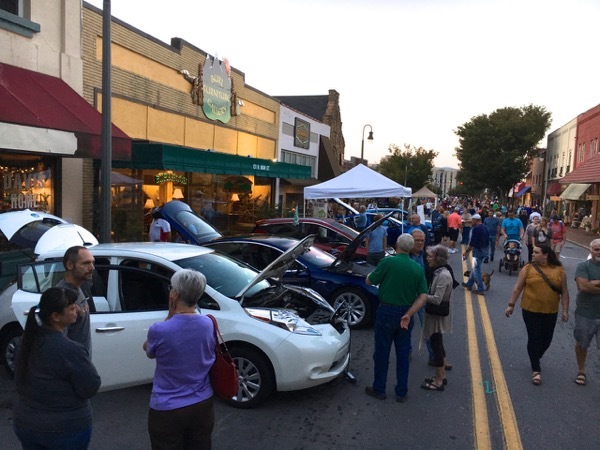 Vehicles visible in photo, left to right, Tesla Model S, Pine Mountain Sports Missan Leaf, Chevy Bolt, Fiat 500e, Kia Soul Electric, VW e-Golf, (front row) Tesla Model S, Nissan Leaf, and another Kia Soul Electric. 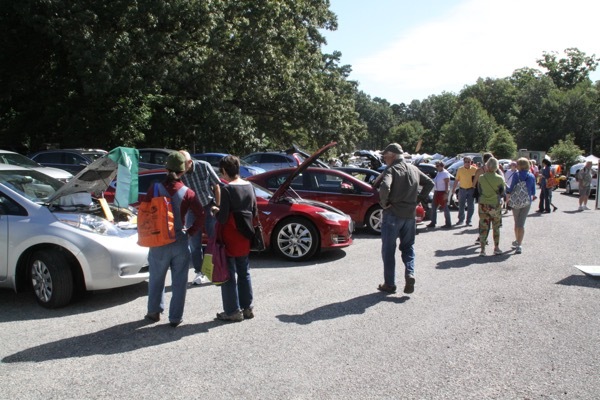 © 2017 Photo by Pine Mountain Sports (event host / bike shop): permission is granted to use this photo to report, support or promote National Drive Electric Week events provided photo credit is given as shown above. All other uses prohibited unless written permission is granted by the owner. 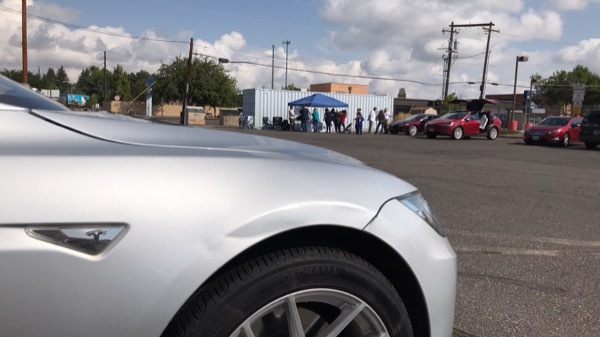 This photo shows the vehicle line up. © 2017 Kathy Kerridge: permission is granted to use this photo to report, support or promote National Drive Electric Week events provided photo credit is given as shown above. All other uses prohibited unless written permission is granted by the owner. Craig Synder has his face to the camera. 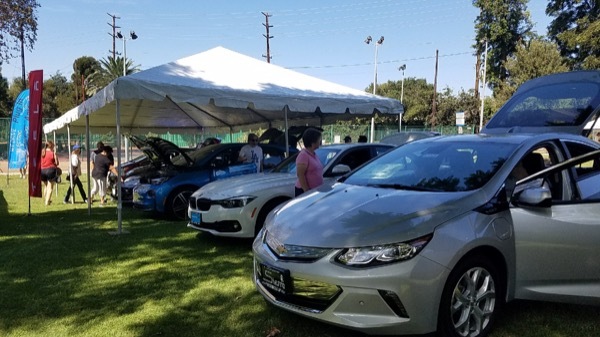 There is a Chevy Volt, a Nissan Leaf, and a Chevy Bolt. 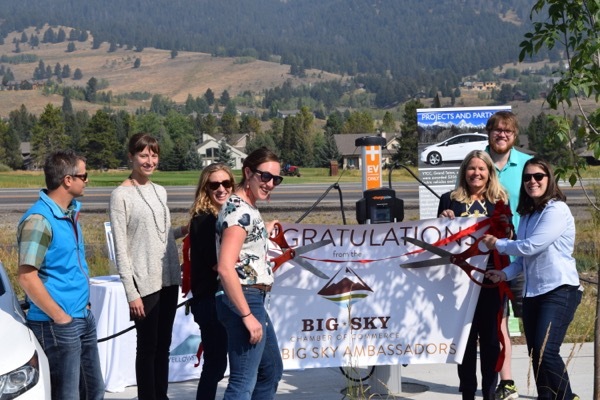 Ryan Hamilton of Big Sky Town Center, Christina Calabrese of Lone Mountain Land Company, Alicia Cox of Yellowstone-Teton Clean Cities, Christy Lewis of Yellowstone-Teton Clean Cities, Lisa Lillelund of Mango Networks, Rick Simkins of Big Sky Town Center, Kyla Maki of Montana Department of Quality. © 2017 Margo Magnant: permission is granted to use this photo to report, support or promote National Drive Electric Week events provided photo credit is given as shown above. All other uses prohibited unless written permission is granted by the owner. © 2017 Erik Leonard: permission is granted to use this photo to report, support or promote National Drive Electric Week events provided photo credit is given as shown above. All other uses prohibited unless written permission is granted by the owner. Birmingham 2017 NDEW. Awards, Food Truck, Great People, Great Cars, Great Time. See yah next year. © 2017 David Radzieta - ZEOG: permission is granted to use this photo to report, support or promote National Drive Electric Week events provided photo credit is given as shown above. All other uses prohibited unless written permission is granted by the owner. © 2017 Don Dulchinos: permission is granted to use this photo to report, support or promote National Drive Electric Week events provided photo credit is given as shown above. All other uses prohibited unless written permission is granted by the owner. © 2017 Kerb Space: permission is granted to use this photo to report, support or promote National Drive Electric Week events provided photo credit is given as shown above. All other uses prohibited unless written permission is granted by the owner. © 2017 Pamela Thwaite: permission is granted to use this photo to report, support or promote National Drive Electric Week events provided photo credit is given as shown above. All other uses prohibited unless written permission is granted by the owner. 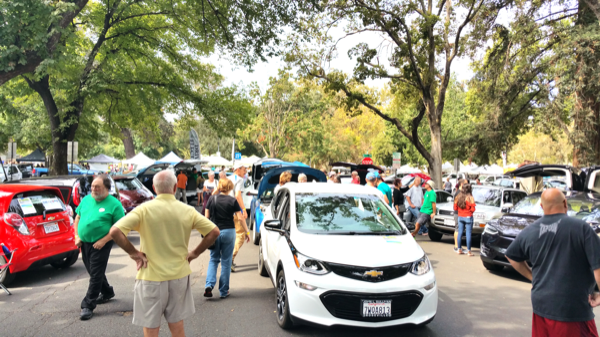 Visitors discuss the Bolt, Volt, CMax Energi, BMW i3 and other electric cars on display. 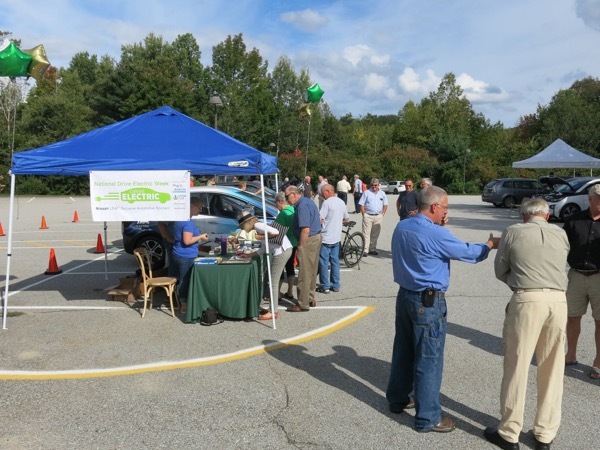 © 2017 Drive Electric Vermont: permission is granted to use this photo to report, support or promote National Drive Electric Week events provided photo credit is given as shown above. All other uses prohibited unless written permission is granted by the owner. © 2017 Michael Subasic: permission is granted to use this photo to report, support or promote National Drive Electric Week events provided photo credit is given as shown above. All other uses prohibited unless written permission is granted by the owner. 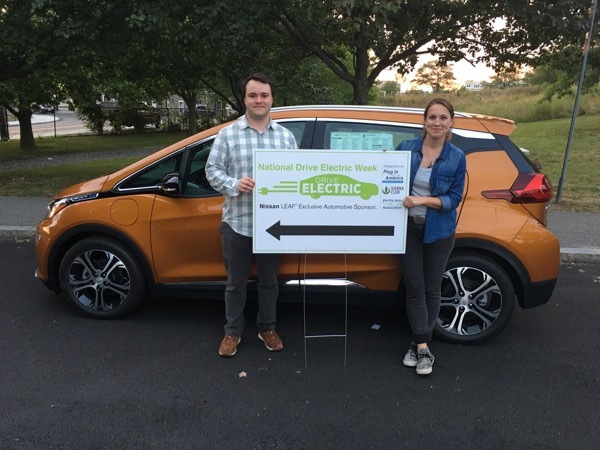 Jordan Webster and Bronwyn Cooke from the City of Cambridge in front of the Chevrolet Bolt from Mirak Chevrolet of Arlington MA. © 2017 Mark Renburke: permission is granted to use this photo to report, support or promote National Drive Electric Week events provided photo credit is given as shown above. All other uses prohibited unless written permission is granted by the owner. © 2017 Simon Mahan: permission is granted to use this photo to report, support or promote National Drive Electric Week events provided photo credit is given as shown above. All other uses prohibited unless written permission is granted by the owner. © 2017 Richard Steiner: permission is granted to use this photo to report, support or promote National Drive Electric Week events provided photo credit is given as shown above. All other uses prohibited unless written permission is granted by the owner. Misc. people with their EV's. 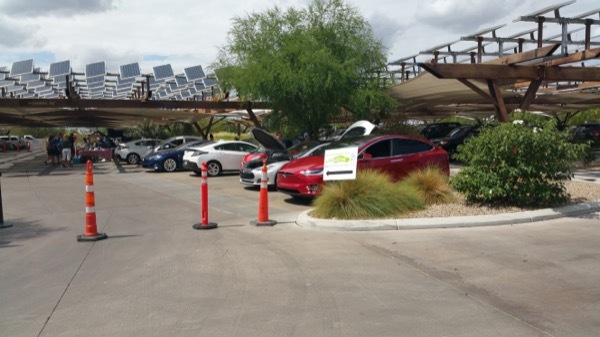 Vehicles in shot are Tesla's , Bolt, Volt, Leaf with solar charging station in the background. © 2017 Richard Steiner og Hoosier EV Club & Jesse Kirkham Heartland Group of the Hoosier Chapter of the Sierra Club: permission is granted to use this photo to report, support or promote National Drive Electric Week events provided photo credit is given as shown above. All other uses prohibited unless written permission is granted by the owner. 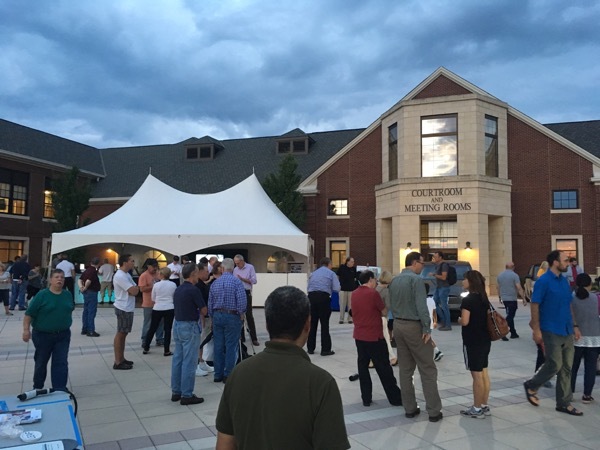 Photo Credit: Rich Hirschberg, Vice President - Fox Valley Electric Auto Assn. 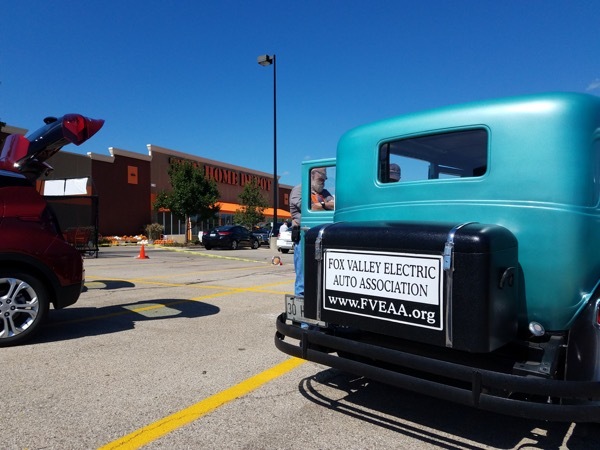 © 2017 Rich Hirschberg, Vice President - Fox Valley Electric Auto Assn. : permission is granted to use this photo to report, support or promote National Drive Electric Week events provided photo credit is given as shown above. All other uses prohibited unless written permission is granted by the owner. 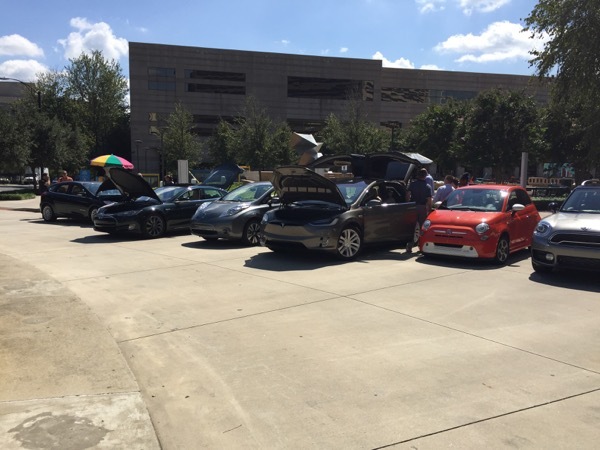 (L to R): Ford Focus, City of Charlotte; Tesla Model S, Andrew Diamond; Nissan Leaf; Tesla Model X, Robert Reynolds; Fiat 500e, Juan Boyce; BMW Mini Cooper, Cody Smith. © 2017 Carina Soriano, Centralina Clean Fuels Coalition: permission is granted to use this photo to report, support or promote National Drive Electric Week events provided photo credit is given as shown above. All other uses prohibited unless written permission is granted by the owner. © 2017 Zackary Garvelink: permission is granted to use this photo to report, support or promote National Drive Electric Week events provided photo credit is given as shown above. All other uses prohibited unless written permission is granted by the owner. The Workhorse W-15 Pickup Truck, the worlds first electric pickup built from the ground up. 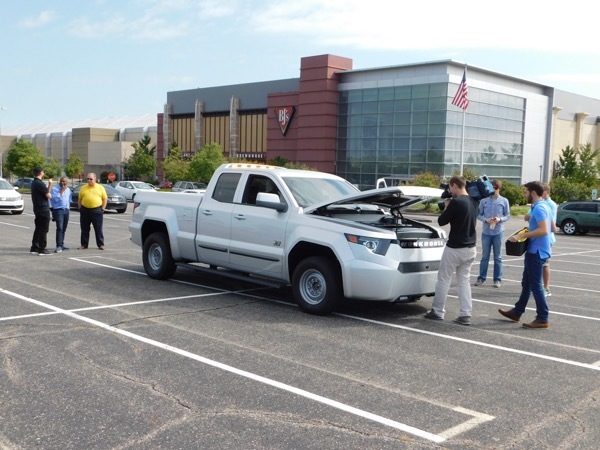 At the rear of the truck are John Willig of Workhorse, WLWT reporter Richard Chiles, and Mike Detkas of Workhorse. At the front of the W-15 is Tony Bort of Workhorse, with a WLWT cameraman. 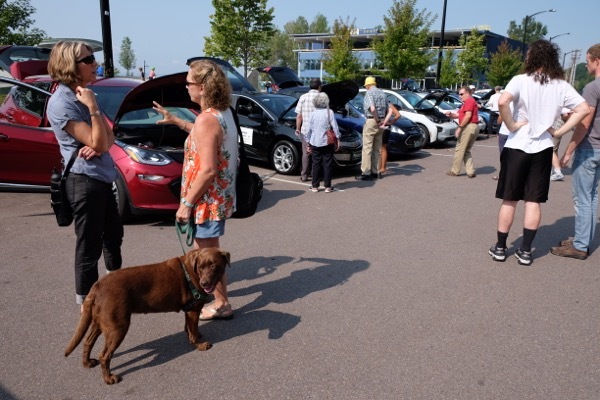 © 2017 Susan McCullough: permission is granted to use this photo to report, support or promote National Drive Electric Week events provided photo credit is given as shown above. All other uses prohibited unless written permission is granted by the owner. 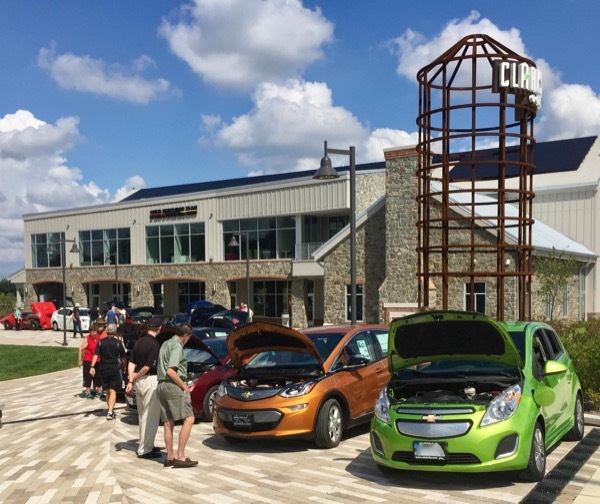 The Clarksville Commons plaza provided a great setting for showing and admiring electric cars. © 2017 Roger Caplan, The Caplan Group: permission is granted to use this photo to report, support or promote National Drive Electric Week events provided photo credit is given as shown above. All other uses prohibited unless written permission is granted by the owner. Phillip Washington (seated) Tesla Roadster provided by Dr. Ezra Riber. 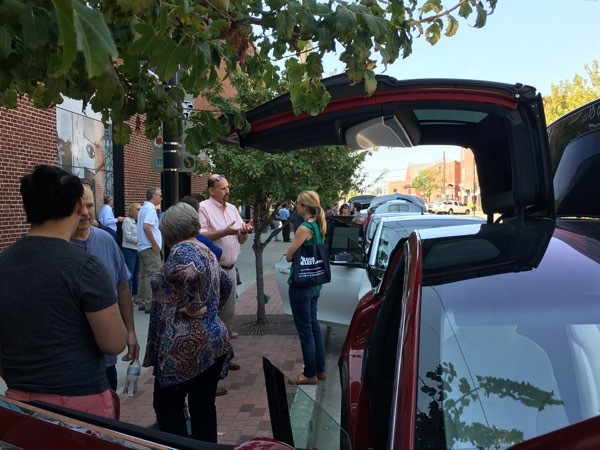 Representative Brown came to our event and took a test drive in a Tesla Model S.
© 2017 Clean Fuels Ohio: permission is granted to use this photo to report, support or promote National Drive Electric Week events provided photo credit is given as shown above. All other uses prohibited unless written permission is granted by the owner. 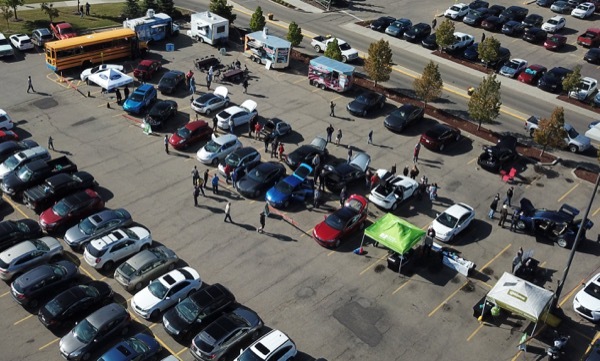 A wide view of the parking lot filled with EV vehicles. © 2017 Lynn Stan: permission is granted to use this photo to report, support or promote National Drive Electric Week events provided photo credit is given as shown above. All other uses prohibited unless written permission is granted by the owner. 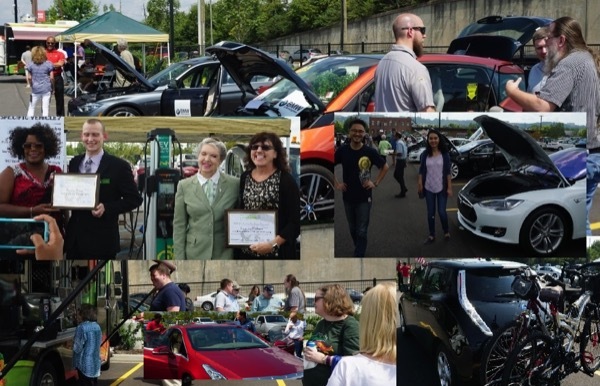 © 2017 Charlotte Electric Auto Association: permission is granted to use this photo to report, support or promote National Drive Electric Week events provided photo credit is given as shown above. All other uses prohibited unless written permission is granted by the owner. Looking down half the State Capital Plaza. NH Dept. Environmental Services was one of our sponsors. © 2017 Jon Gundersen: permission is granted to use this photo to report, support or promote National Drive Electric Week events provided photo credit is given as shown above. All other uses prohibited unless written permission is granted by the owner. © 2017 Wayne Willmon: permission is granted to use this photo to report, support or promote National Drive Electric Week events provided photo credit is given as shown above. All other uses prohibited unless written permission is granted by the owner. 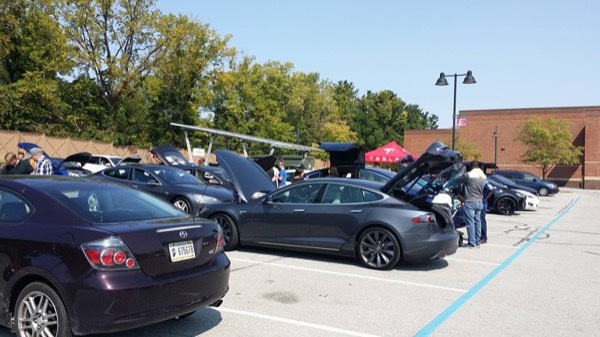 Reid Joyce talk shop about his Chevrolet Volt on the left and Ed Komoroski's blue Tesla model S on the right. Note, Zachary Barnett's Mitsubishi i Miev in the background. © 2017 Lou Hancherick: permission is granted to use this photo to report, support or promote National Drive Electric Week events provided photo credit is given as shown above. All other uses prohibited unless written permission is granted by the owner. 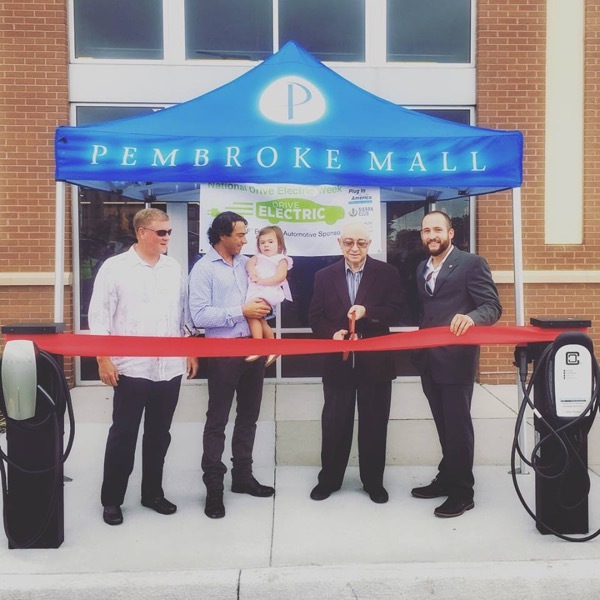 Left to right: Tyler Rines, Charles Garena, David Robinson, Erick Pinzon, and others cut the ribbon on electric chargers with tesla S's in the background. 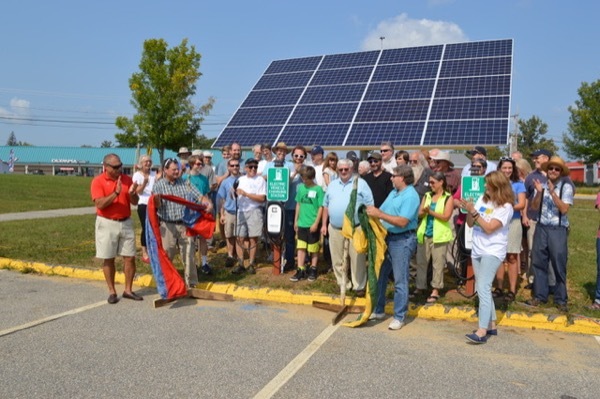 © 2017 Virginia Clean Cities: permission is granted to use this photo to report, support or promote National Drive Electric Week events provided photo credit is given as shown above. All other uses prohibited unless written permission is granted by the owner. 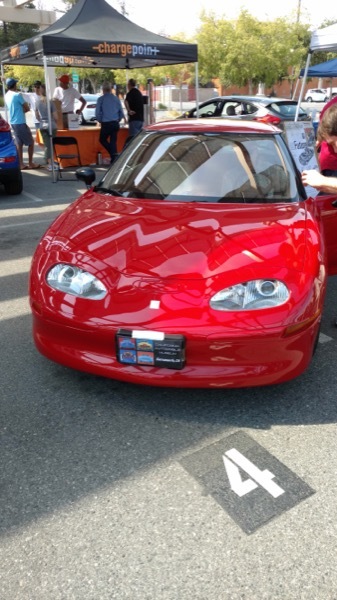 General Motors EV1 displayed by G. Stuckert and the California Auto Museum in Sacramento, CA. © 2017 Ben White: permission is granted to use this photo to report, support or promote National Drive Electric Week events provided photo credit is given as shown above. All other uses prohibited unless written permission is granted by the owner. 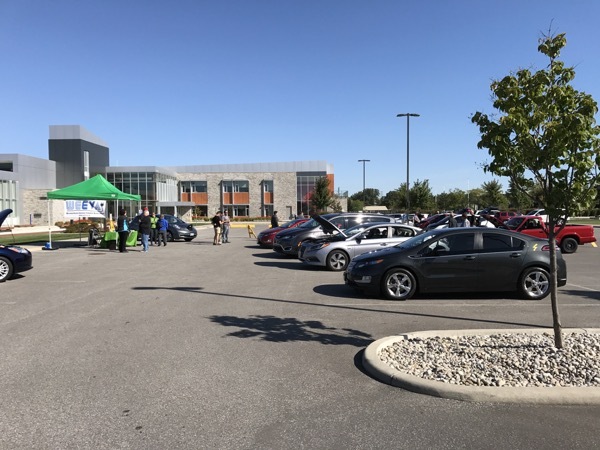 © 2017 SacEV: permission is granted to use this photo to report, support or promote National Drive Electric Week events provided photo credit is given as shown above. All other uses prohibited unless written permission is granted by the owner. 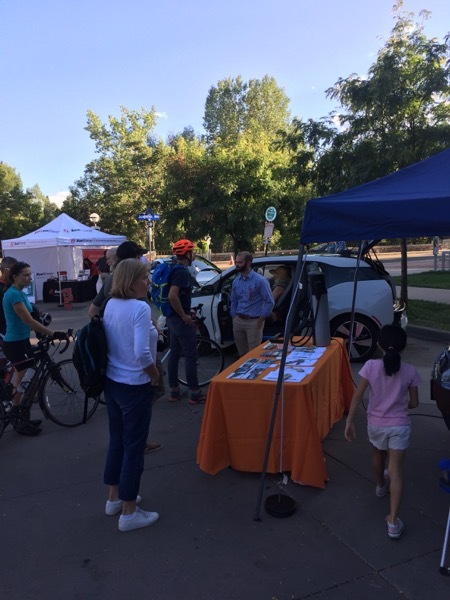 © 2017 Denver Clean Cities: permission is granted to use this photo to report, support or promote National Drive Electric Week events provided photo credit is given as shown above. All other uses prohibited unless written permission is granted by the owner. © 2017 Mary Collins: permission is granted to use this photo to report, support or promote National Drive Electric Week events provided photo credit is given as shown above. All other uses prohibited unless written permission is granted by the owner. © 2017 Dunedin EV Group: permission is granted to use this photo to report, support or promote National Drive Electric Week events provided photo credit is given as shown above. All other uses prohibited unless written permission is granted by the owner. 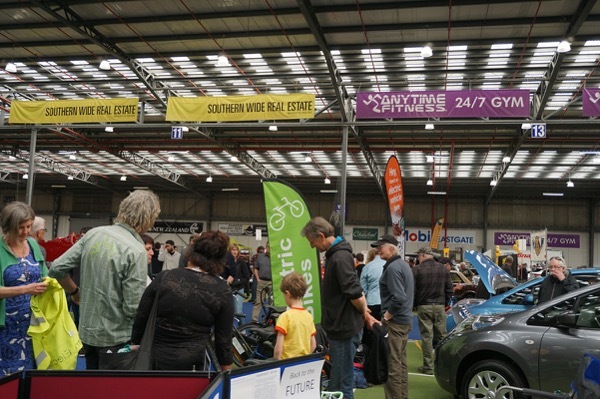 Crowd shot at Autospectacular - Dunedin EV Owners Stand. 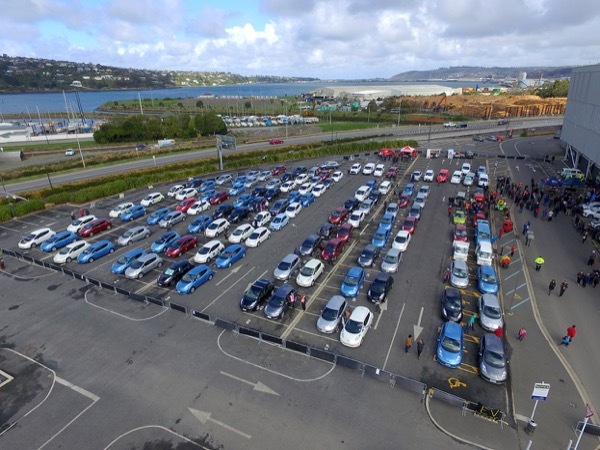 Dunedin EV Owners were the newest automobile club to display at Autospectacular but we had a display of 100 years of EV motoring on our court. 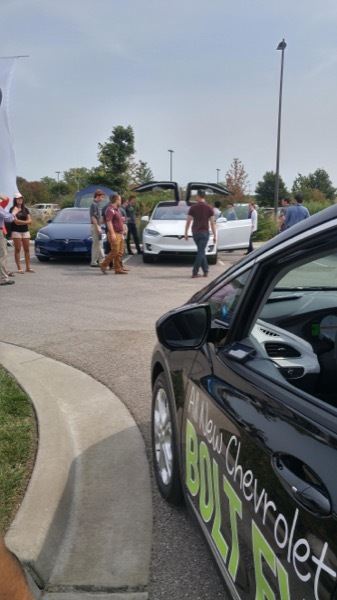 The Plug-in NC team stands in front of a Tesla Model X at the National Drive Electric Week event. 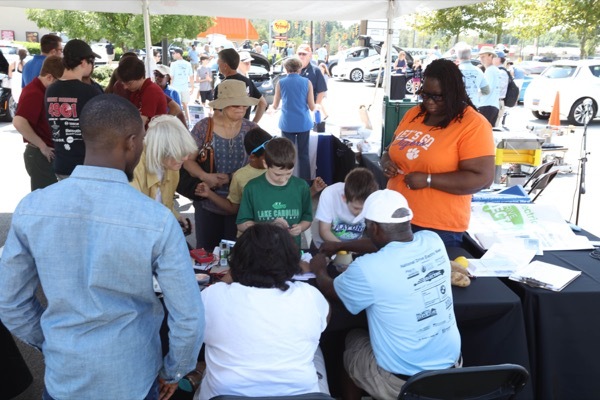 © 2017 Plug-in NC: permission is granted to use this photo to report, support or promote National Drive Electric Week events provided photo credit is given as shown above. All other uses prohibited unless written permission is granted by the owner. 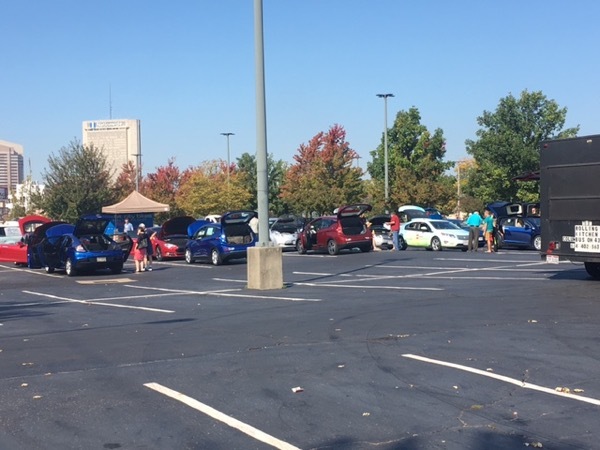 Durham National Drive Electric Panorama with Chevy Volts, Chevy Bolts, Nissan Leafs, BMW i3s, Tesla S and X models, SmartCar, Toyota Prius Prime, a rare Toyota RAV EV, and more. © 2017 Charlie Forcey, Durham Energy Committee: permission is granted to use this photo to report, support or promote National Drive Electric Week events provided photo credit is given as shown above. All other uses prohibited unless written permission is granted by the owner. 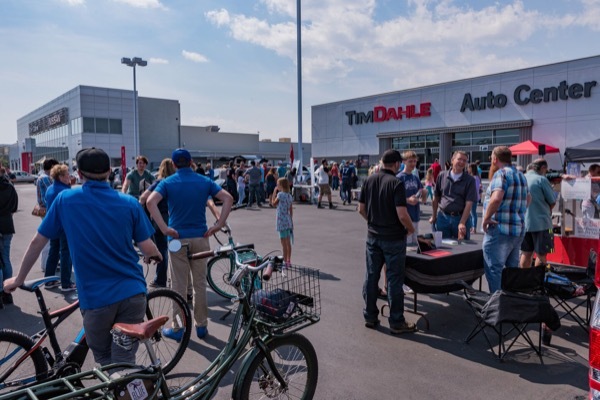 Vehicles at the National Drive Electric Week event at the Eagan HyVee included (left to right): 2017 Nissan Leaf, 2017 Tesla Model X, 2017 Chevy Bolt EV, and 2017 Chevy Volt. 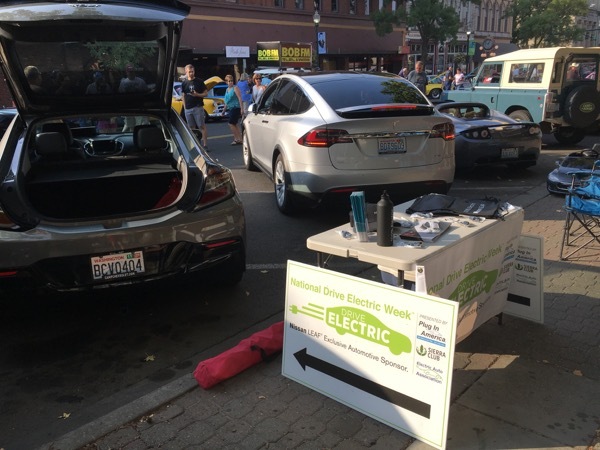 © 2017 Will Dunder: permission is granted to use this photo to report, support or promote National Drive Electric Week events provided photo credit is given as shown above. All other uses prohibited unless written permission is granted by the owner. © 2017 Dave Oliveria: permission is granted to use this photo to report, support or promote National Drive Electric Week events provided photo credit is given as shown above. All other uses prohibited unless written permission is granted by the owner. © 2017 Andrew Batiuk/EVAA: permission is granted to use this photo to report, support or promote National Drive Electric Week events provided photo credit is given as shown above. All other uses prohibited unless written permission is granted by the owner. 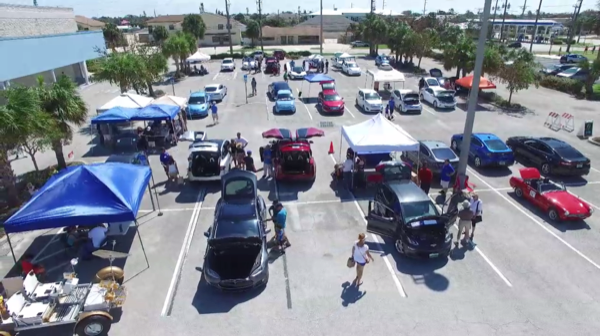 In the aftermath of Hurricane Irma, SWFL EV Owners came out to show the community that EVs are viable even in times of a natural disaster! © 2017 Jason Caissie: permission is granted to use this photo to report, support or promote National Drive Electric Week events provided photo credit is given as shown above. All other uses prohibited unless written permission is granted by the owner. © 2017 : permission is granted to use this photo to report, support or promote National Drive Electric Week events provided photo credit is given as shown above. All other uses prohibited unless written permission is granted by the owner. © 2017 Scott Thompson: permission is granted to use this photo to report, support or promote National Drive Electric Week events provided photo credit is given as shown above. All other uses prohibited unless written permission is granted by the owner. © 2017 Carol Simmons: permission is granted to use this photo to report, support or promote National Drive Electric Week events provided photo credit is given as shown above. All other uses prohibited unless written permission is granted by the owner. © 2017 Bob M.: permission is granted to use this photo to report, support or promote National Drive Electric Week events provided photo credit is given as shown above. All other uses prohibited unless written permission is granted by the owner. 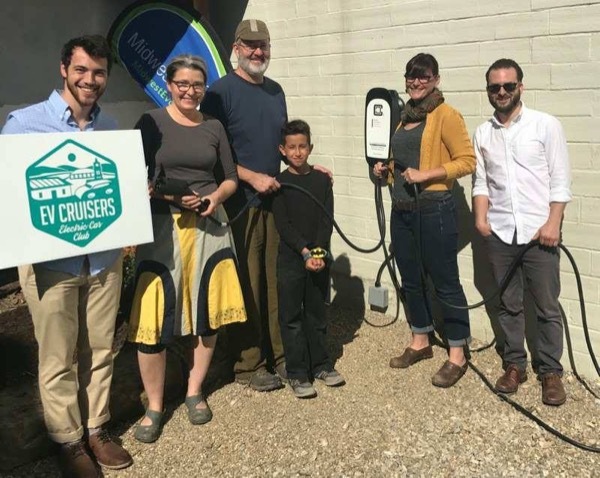 Fayetteville, Arkansas Mayor Lioneld Jordan urges support for electric vehicles and more EV charging stations. 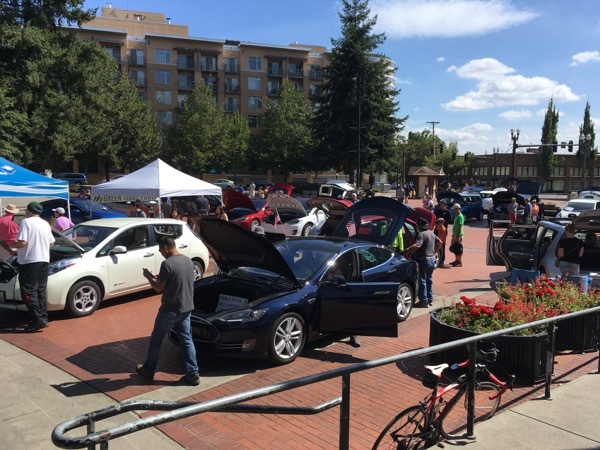 © 2017 Glen Hooks/AR Sierra Club: permission is granted to use this photo to report, support or promote National Drive Electric Week events provided photo credit is given as shown above. All other uses prohibited unless written permission is granted by the owner. © 2017 Guy Hall: permission is granted to use this photo to report, support or promote National Drive Electric Week events provided photo credit is given as shown above. All other uses prohibited unless written permission is granted by the owner. 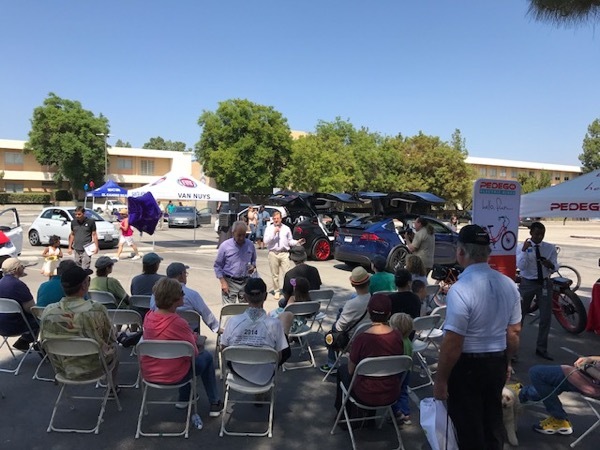 © 2017 Victor Ibarra - Field Deputy, Office of Assemblyman Mike Gibson: permission is granted to use this photo to report, support or promote National Drive Electric Week events provided photo credit is given as shown above. All other uses prohibited unless written permission is granted by the owner. 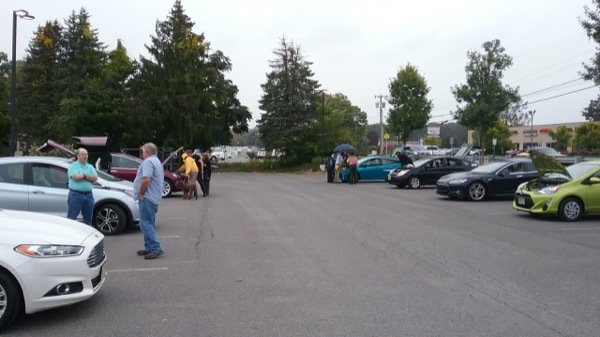 This is a photo of the City fleet lined up in the parking lot. They were easily seen by people driving by. 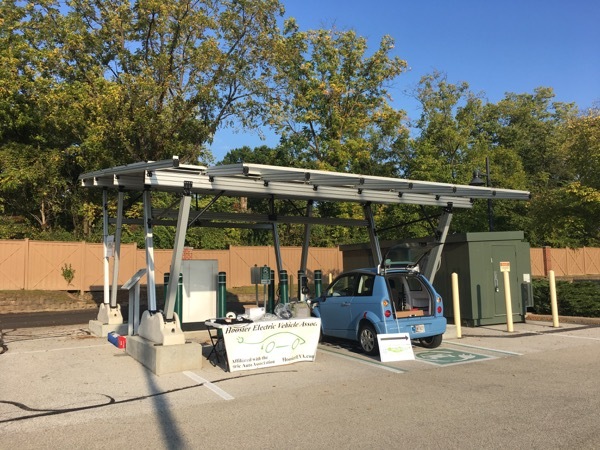 © 2017 Pat Bench: permission is granted to use this photo to report, support or promote National Drive Electric Week events provided photo credit is given as shown above. All other uses prohibited unless written permission is granted by the owner. 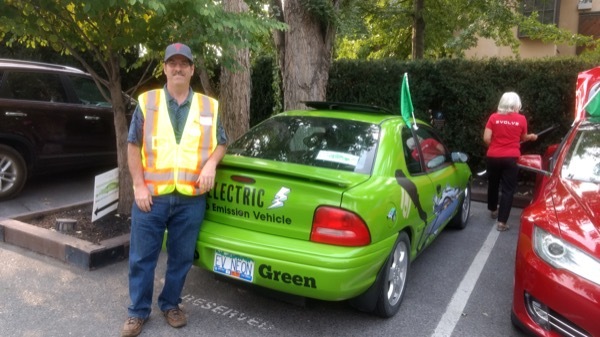 © 2017 Jim Smith, city captain: permission is granted to use this photo to report, support or promote National Drive Electric Week events provided photo credit is given as shown above. All other uses prohibited unless written permission is granted by the owner. 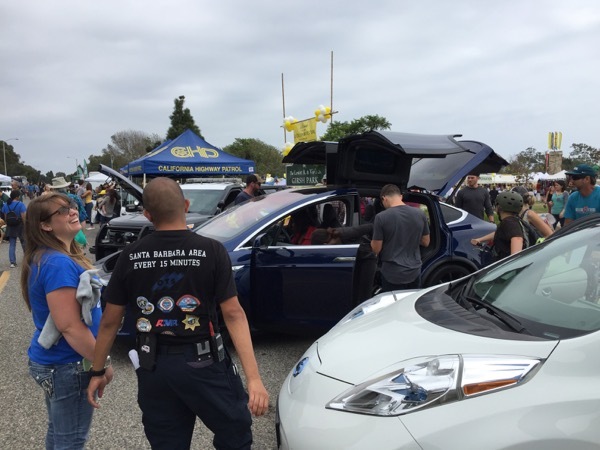 Savanna Cooper can't hold back her beaming smile as she talks with a local California Highway Patrol officer about her Tesla Model X's quick acceleration and powerful performance during the 2017 Goleta Drive Electric event at the Calfornia Lemon Festival. 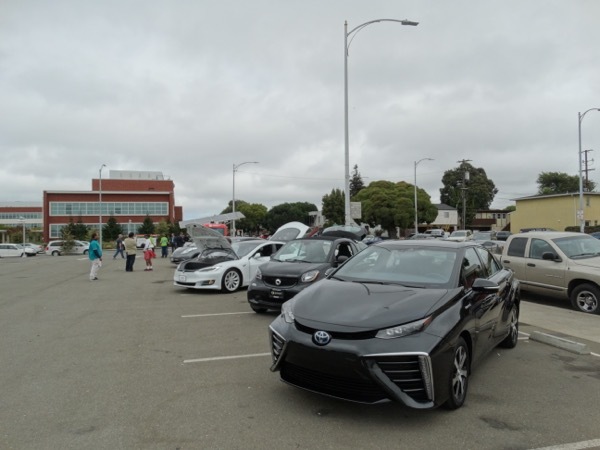 The event was organized by Community Environmental Council, in partnership with the Goleta Valley Chamber of Commerce, Santa Barbara County Air Pollution Control District, Los Padres Sierra Club Chapter, and Plug-in America. 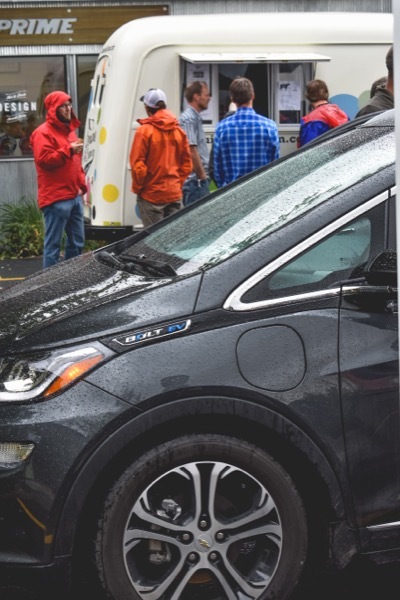 © 2017 Cameron Gray/Community Environmental Council: permission is granted to use this photo to report, support or promote National Drive Electric Week events provided photo credit is given as shown above. All other uses prohibited unless written permission is granted by the owner. 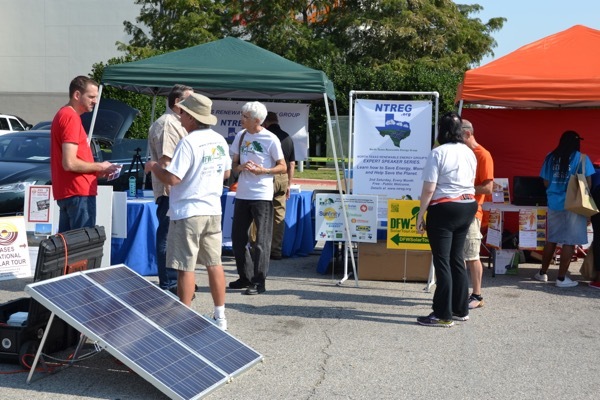 North Texas NDEW visitors learn about the solar and EV connection. 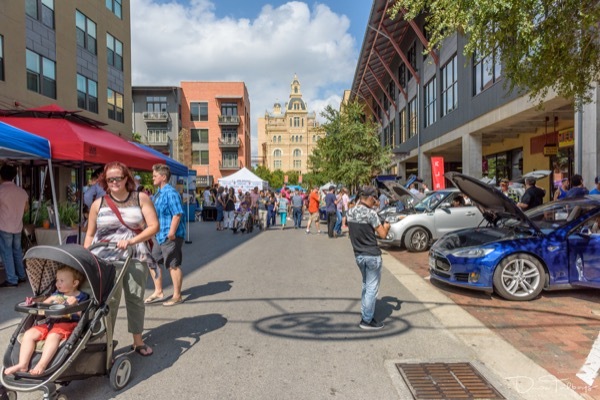 © 2017 North Central Texas Council of Governments: permission is granted to use this photo to report, support or promote National Drive Electric Week events provided photo credit is given as shown above. All other uses prohibited unless written permission is granted by the owner. © 2017 Sheble McConnellogue: permission is granted to use this photo to report, support or promote National Drive Electric Week events provided photo credit is given as shown above. All other uses prohibited unless written permission is granted by the owner. 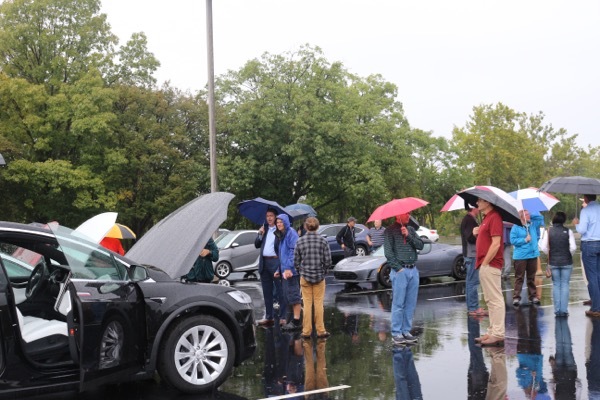 Jim Mackovjack, Greg Streveler, and David Thomas show off their rain-powered rides for National Drive Electric Week. © 2017 Nathan Borson: permission is granted to use this photo to report, support or promote National Drive Electric Week events provided photo credit is given as shown above. All other uses prohibited unless written permission is granted by the owner. 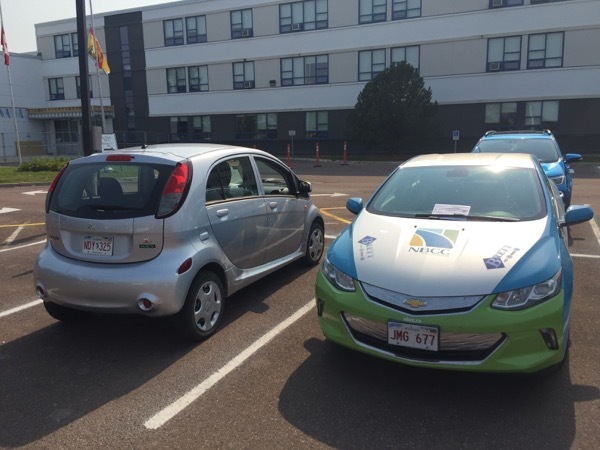 © 2017 Nova Scotia Power: permission is granted to use this photo to report, support or promote National Drive Electric Week events provided photo credit is given as shown above. All other uses prohibited unless written permission is granted by the owner. 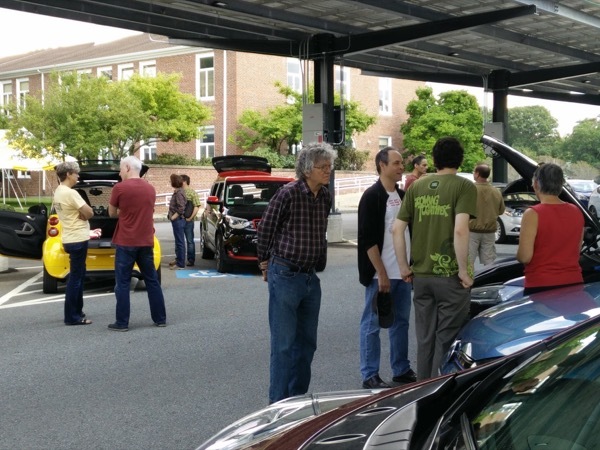 At the Unitarian Society - Volts, Bolts, Teslas, Leafs, a BMW 13 REx, and Focus Electric. 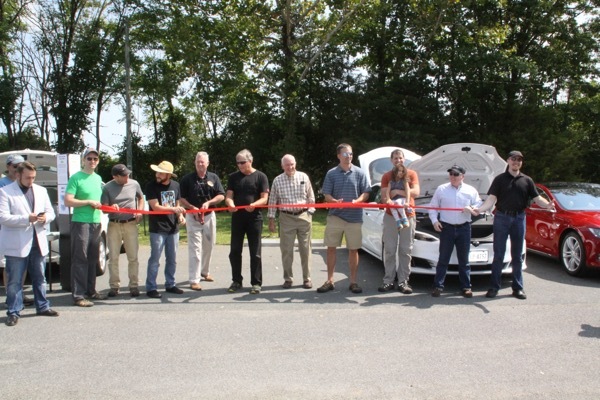 12 Vehicles in all, and out focus was to Electrify the local community and the University of Hartford! © 2017 Jeff Gross: permission is granted to use this photo to report, support or promote National Drive Electric Week events provided photo credit is given as shown above. All other uses prohibited unless written permission is granted by the owner. 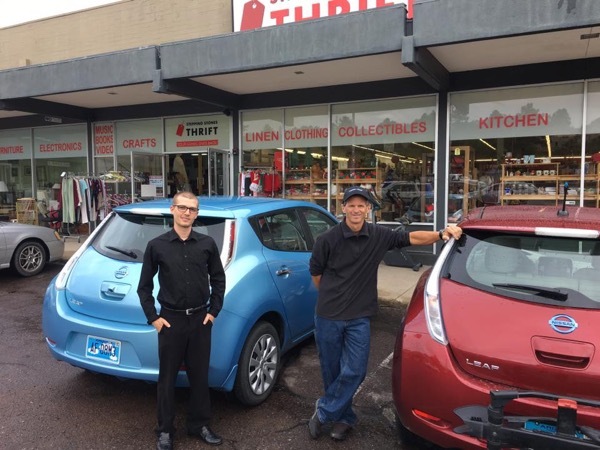 From left to right: Bruce Brown's 2015 Nissan Leaf, Ben Brown's 2010 Mitsubishi i-MiEV, Paul Pancella's 2013 Nissan Leaf. 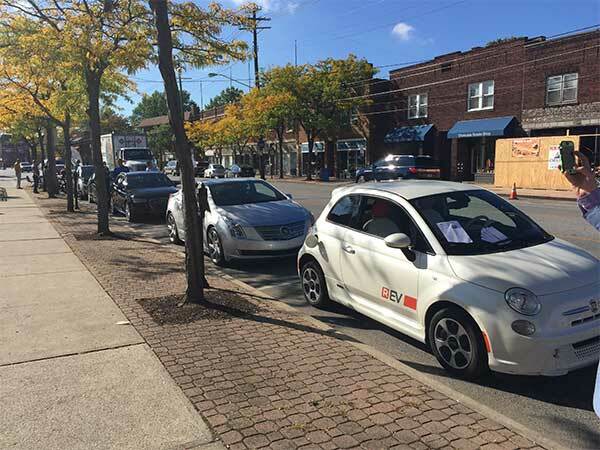 © 2017 Paul Pancella of Kalamazoo Electric Vehicle Association: permission is granted to use this photo to report, support or promote National Drive Electric Week events provided photo credit is given as shown above. All other uses prohibited unless written permission is granted by the owner. © 2017 Gary Miller: permission is granted to use this photo to report, support or promote National Drive Electric Week events provided photo credit is given as shown above. All other uses prohibited unless written permission is granted by the owner. 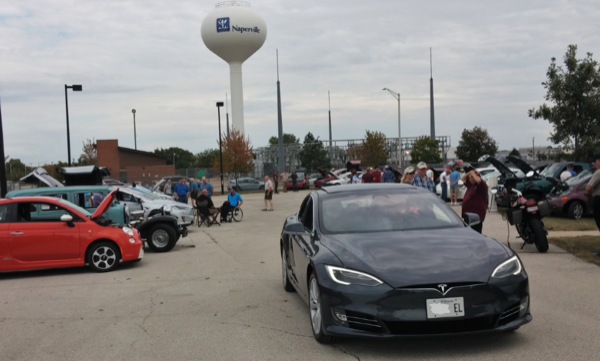 The participants at one of three staging areas for the 2017 Electric Island Drive with their various models of electric vehicles. © 2017 Reggie Padilla: permission is granted to use this photo to report, support or promote National Drive Electric Week events provided photo credit is given as shown above. All other uses prohibited unless written permission is granted by the owner. © 2017 Kevin Douglass - HEAA: permission is granted to use this photo to report, support or promote National Drive Electric Week events provided photo credit is given as shown above. All other uses prohibited unless written permission is granted by the owner. © 2017 Alex Rocha Ura: permission is granted to use this photo to report, support or promote National Drive Electric Week events provided photo credit is given as shown above. All other uses prohibited unless written permission is granted by the owner. 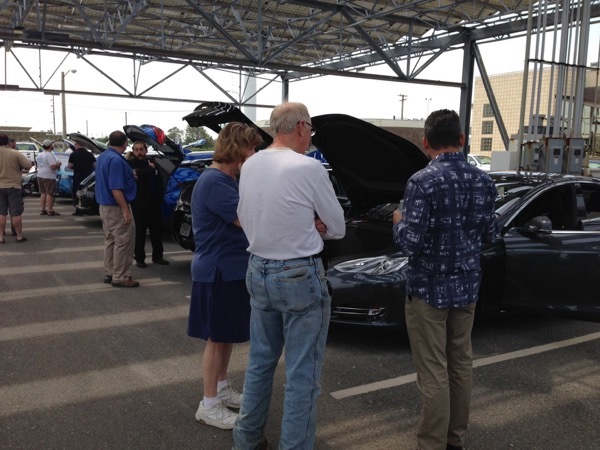 Various attendees check out the electric vehicles and discuss with EV owners the advantages of "driving green." 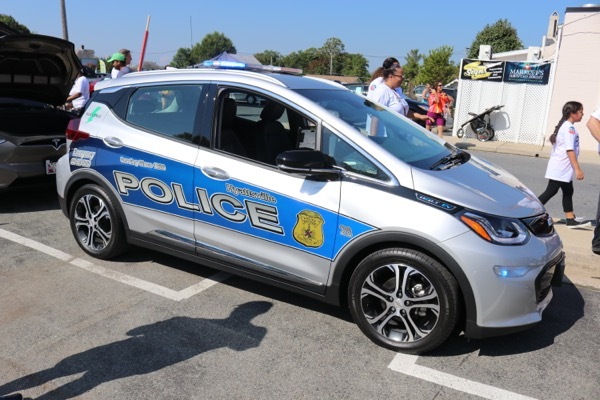 In the front row is the Silver 2017 Chevrolet Bolt Police Cruiser, as well as a White/Black 2017 Zero DSP Electric Police Motorcycle. 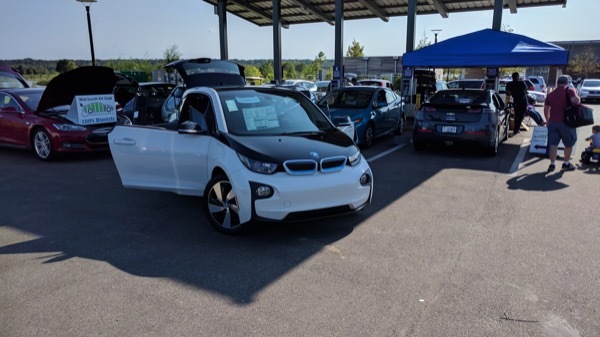 Other vehicles at the show included a BMW i3 REx, Tesla Model "X," Nissan Leaf, Mitsubishi Mi-EV, Brammo Electric Motorcycle, Ford Focus EV, Chevrolet Spark EV, Tesla Roadster, Chevrolet Volt, Kia Soul EV, Volkswagen e-Golf, Tesla Model "S," a GEM/Polaris LSV (Used by Parking Enforcement), and one of many Segway Personal Mobility Vehicles used by the Police Department. © 2017 Richard Hartnett: permission is granted to use this photo to report, support or promote National Drive Electric Week events provided photo credit is given as shown above. All other uses prohibited unless written permission is granted by the owner. © 2017 Tara Bono: permission is granted to use this photo to report, support or promote National Drive Electric Week events provided photo credit is given as shown above. All other uses prohibited unless written permission is granted by the owner. © 2017 Tom Saxton, Plug In America: permission is granted to use this photo to report, support or promote National Drive Electric Week events provided photo credit is given as shown above. All other uses prohibited unless written permission is granted by the owner. "It's fall in Juneau. You can tell from all of the Leafs". 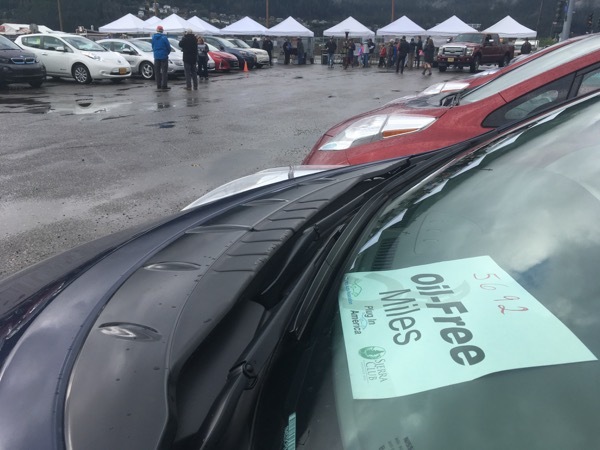 View shot of the rows of electric vehicles at the 4th annual Juneau EV Round Up. 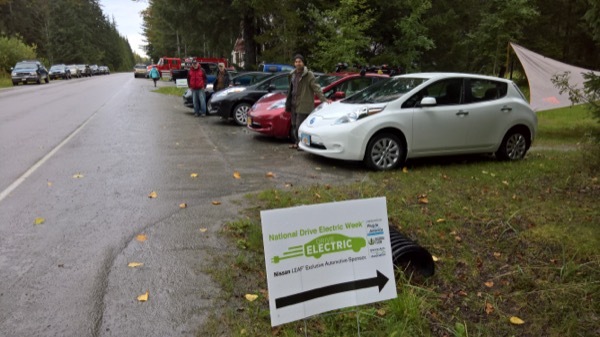 © 2017 James Brooks, Juneau, Alaska: permission is granted to use this photo to report, support or promote National Drive Electric Week events provided photo credit is given as shown above. All other uses prohibited unless written permission is granted by the owner. 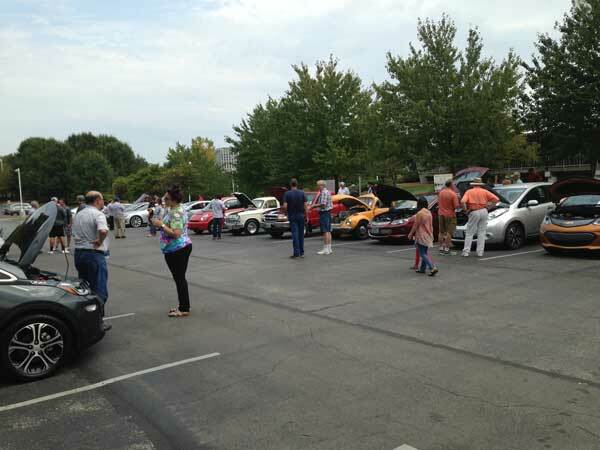 This photo shows less than a quarter of the vehicles that took part in our Kalamazoo demo rides. 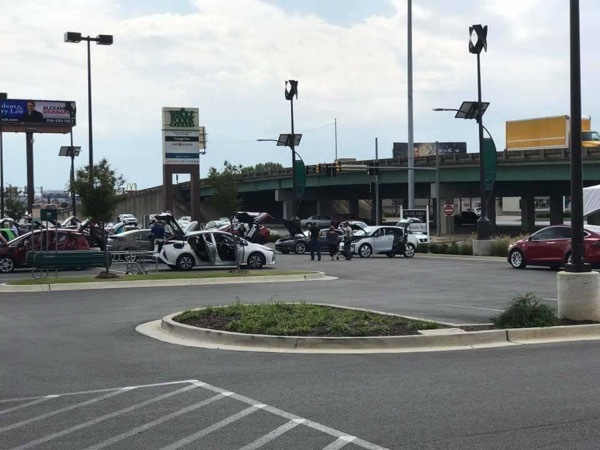 In this shot are two Teslas, a Chevy Bolt, a Chevy Volt, two or three Nissan Leafs and, down at the far end, three Zero Motorcycles. 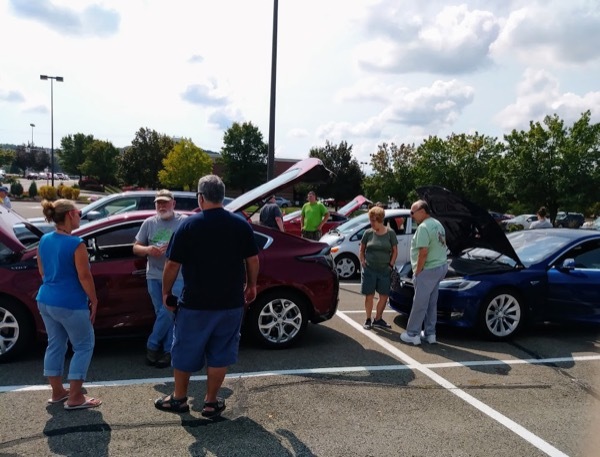 © 2017 Bruce Brown for Sierra Club Southwest Michigan Group: permission is granted to use this photo to report, support or promote National Drive Electric Week events provided photo credit is given as shown above. All other uses prohibited unless written permission is granted by the owner. 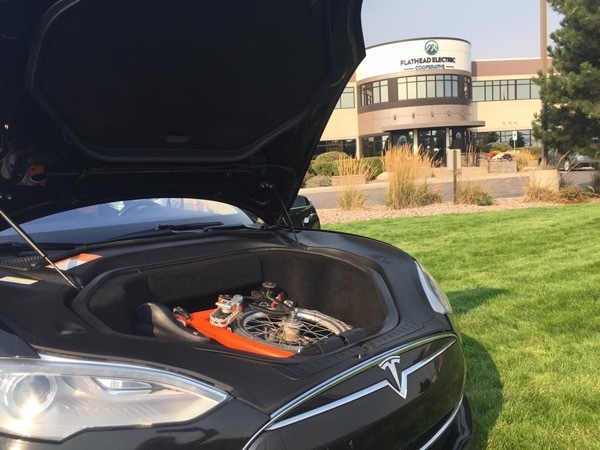 Take a look under the hood of a Tesla... electric vehicles have no engine. This owner keeps his bike there. © 2017 Flathead Electric Cooperative: permission is granted to use this photo to report, support or promote National Drive Electric Week events provided photo credit is given as shown above. All other uses prohibited unless written permission is granted by the owner. 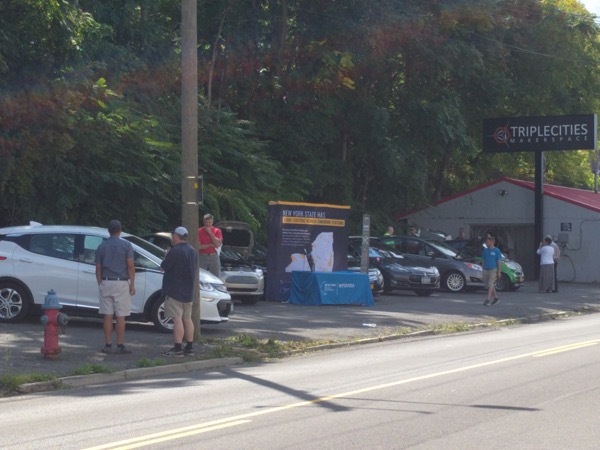 2nd Annual Ulster County Drive Electric week! © 2017 Hugo Jule: permission is granted to use this photo to report, support or promote National Drive Electric Week events provided photo credit is given as shown above. All other uses prohibited unless written permission is granted by the owner. © 2017 WREVA: permission is granted to use this photo to report, support or promote National Drive Electric Week events provided photo credit is given as shown above. All other uses prohibited unless written permission is granted by the owner. 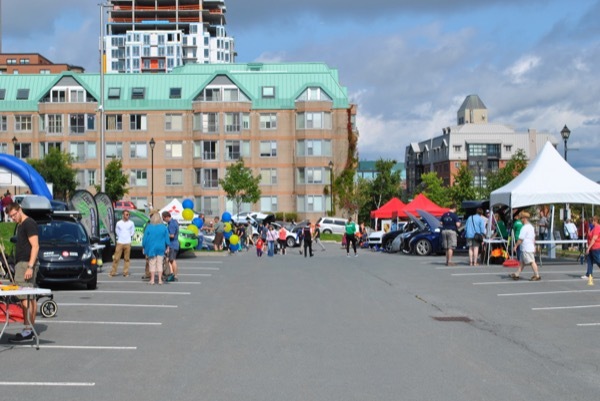 This is a photo collage from the event showing the variety of people and discussions that took place, all of the vehicles we had there (4) and the volume of people that walk by as the event builds towards kickoff. 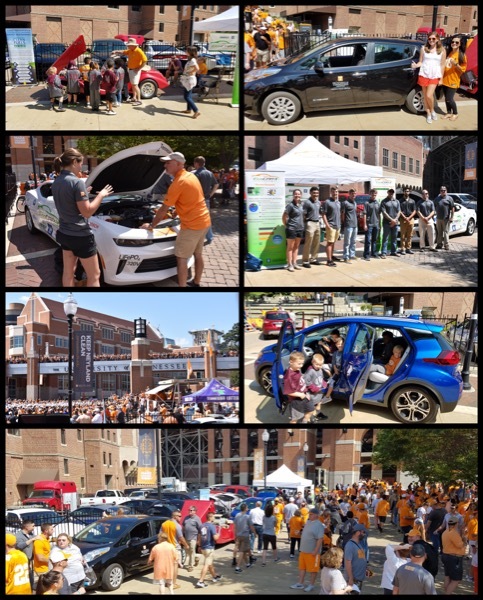 Jonathan Overly of ETCleanFuels & Victoria Ogier of the UTK EcoCAR 3 Program took the photos. © 2017 Jonathan Overly & Victoria Ogier took the photos: permission is granted to use this photo to report, support or promote National Drive Electric Week events provided photo credit is given as shown above. All other uses prohibited unless written permission is granted by the owner. No name for man in military uniform. Will Schleter. Chevy Volt. 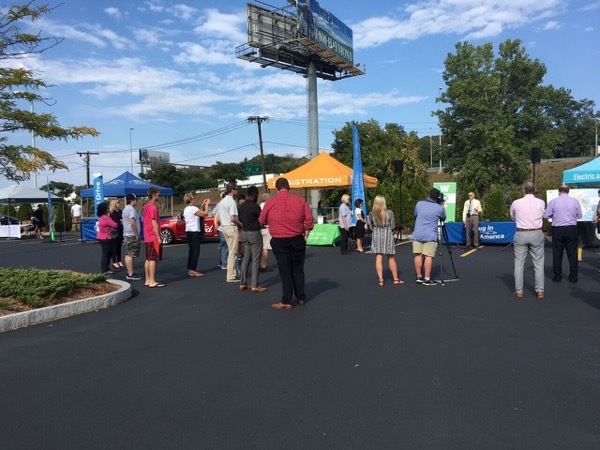 © 2017 East Tennessee Clean Fuels: permission is granted to use this photo to report, support or promote National Drive Electric Week events provided photo credit is given as shown above. All other uses prohibited unless written permission is granted by the owner. © 2017 Michael Peters: permission is granted to use this photo to report, support or promote National Drive Electric Week events provided photo credit is given as shown above. All other uses prohibited unless written permission is granted by the owner. 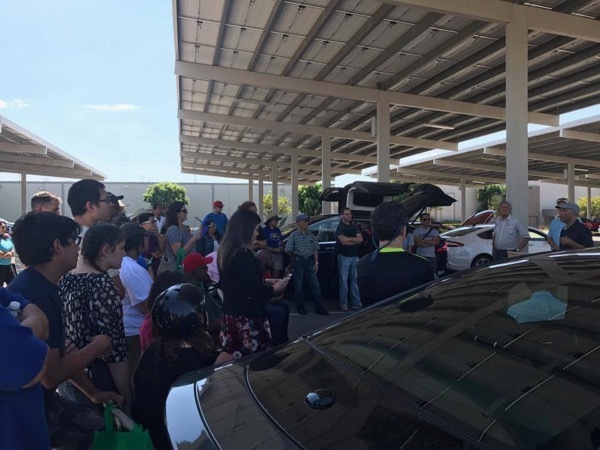 National Drive Electric Week 2017 in Las Vegas featured an electric car rally in the parking lot of the Springs Preserve museum, beneath a photovoltaic solar canopy that tracked the sun and provided electric power to two ChargePoint stations, each with two SAE J1772 AC Level 2 recharging ports. 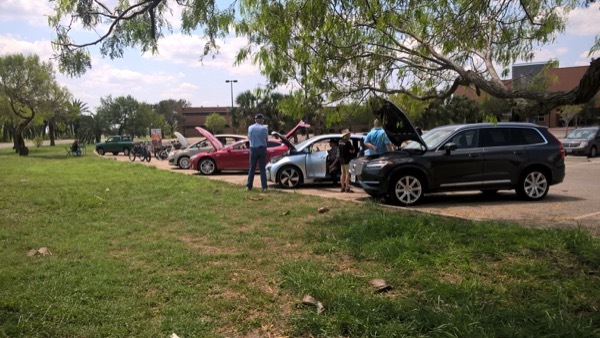 About 40 electric vehicles arrived during the day, including a Tesla Roadster, Tesla Model S, Tesla Model X, Nissan LEAF, GM Chevrolet Volt, GM Chevrolet Spark EV, Ford Fusion Energi, Ford Focus EV, Fiat 500e, Daimler Smart ED, BMW i3, and Mitsubishi i-MiEV. © 2017 Stan Hanel: permission is granted to use this photo to report, support or promote National Drive Electric Week events provided photo credit is given as shown above. All other uses prohibited unless written permission is granted by the owner. Leafs, Teslas, Volts and a Bmw. © 2017 Yanik Dhont: permission is granted to use this photo to report, support or promote National Drive Electric Week events provided photo credit is given as shown above. All other uses prohibited unless written permission is granted by the owner. 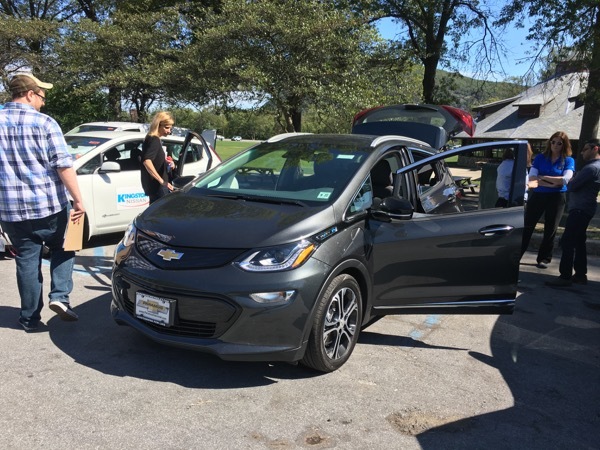 © 2017 Wrensey Gill - EVolve KY: permission is granted to use this photo to report, support or promote National Drive Electric Week events provided photo credit is given as shown above. All other uses prohibited unless written permission is granted by the owner. 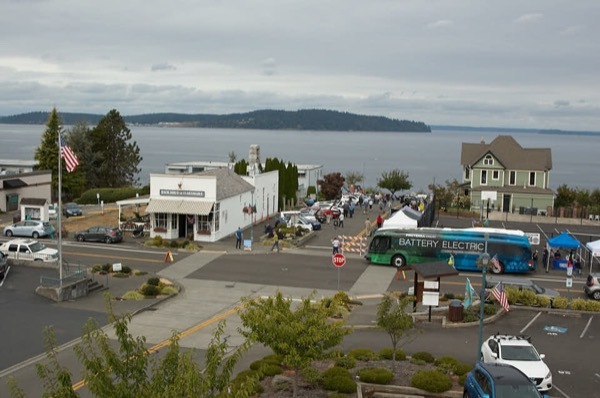 Overview of the charging station area, next year we will expand that area to make room for all of us. © 2017 Jorgen Rasmussen: permission is granted to use this photo to report, support or promote National Drive Electric Week events provided photo credit is given as shown above. All other uses prohibited unless written permission is granted by the owner. Sadly none of our many volunteers had brought a camera, and only when there was a lull in visitors I took a few photos with my phone. 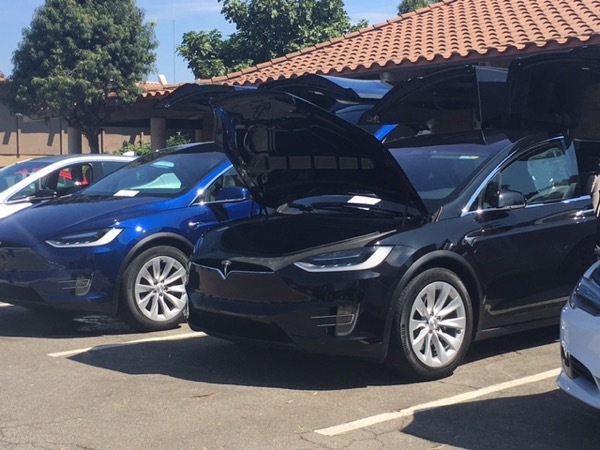 Red Volt, 2 blue Souls, 4 Leafs, Model X in the background, Plug-in Prius almost unrecognizable next to the Model X. 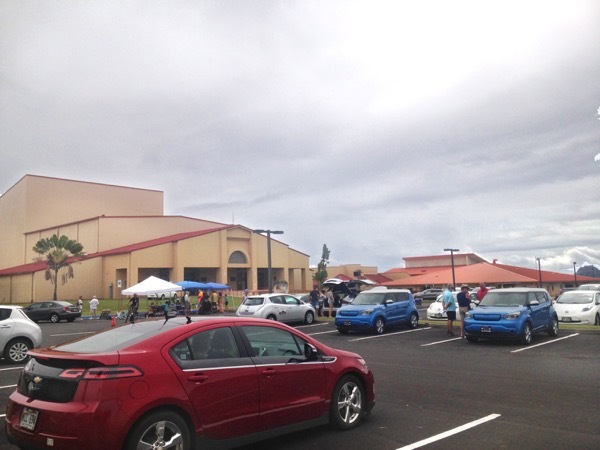 © 2017 KauaiEV: permission is granted to use this photo to report, support or promote National Drive Electric Week events provided photo credit is given as shown above. All other uses prohibited unless written permission is granted by the owner. © 2017 Judi Kusumoto: permission is granted to use this photo to report, support or promote National Drive Electric Week events provided photo credit is given as shown above. All other uses prohibited unless written permission is granted by the owner. 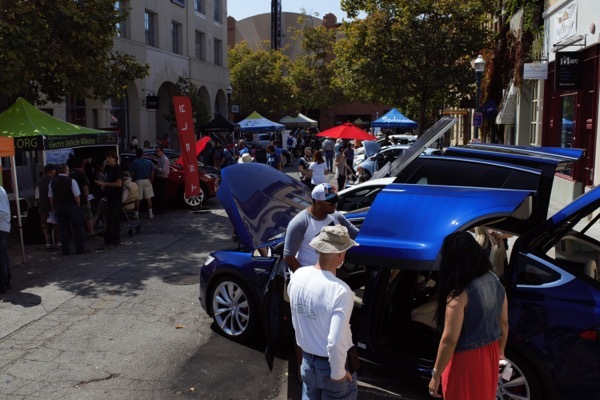 More than 500 EV ride and drives introduced Los Angelenos to the joys of driving electric. © 2017 Chris Corsmeier/LADWP: permission is granted to use this photo to report, support or promote National Drive Electric Week events provided photo credit is given as shown above. All other uses prohibited unless written permission is granted by the owner. 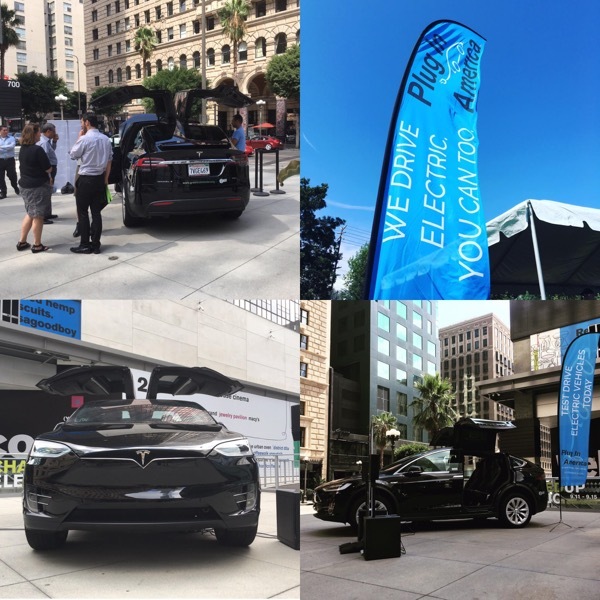 Downtown Los Angeles celebrated National Drive Electric Week, September 2017 at The Bloc, featuring an electric car, the Tesla Model X. 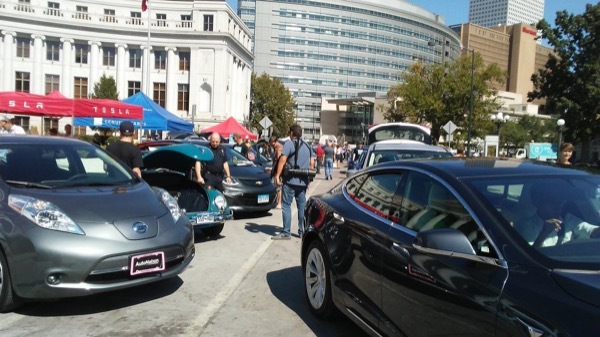 © 2017 Plug In America: permission is granted to use this photo to report, support or promote National Drive Electric Week events provided photo credit is given as shown above. All other uses prohibited unless written permission is granted by the owner. © 2017 Eric Powers: permission is granted to use this photo to report, support or promote National Drive Electric Week events provided photo credit is given as shown above. All other uses prohibited unless written permission is granted by the owner. © 2017 Andrew Stoddard / Alliant Energy: permission is granted to use this photo to report, support or promote National Drive Electric Week events provided photo credit is given as shown above. All other uses prohibited unless written permission is granted by the owner. 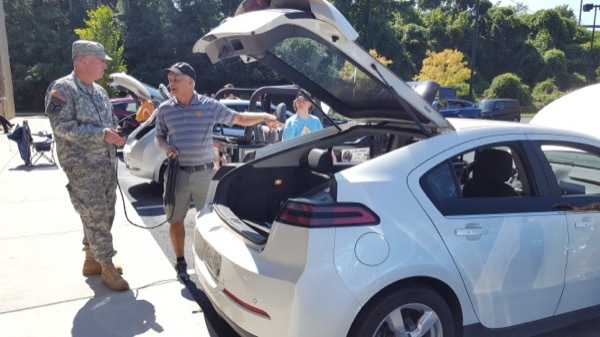 © 2017 Tom Perriello checks out the electric cars: permission is granted to use this photo to report, support or promote National Drive Electric Week events provided photo credit is given as shown above. All other uses prohibited unless written permission is granted by the owner. 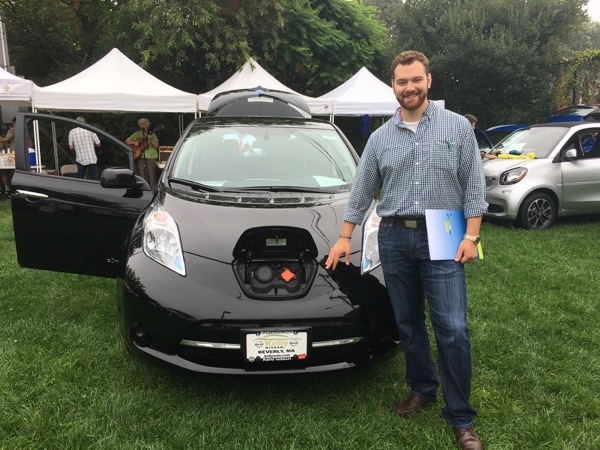 Energy Efficiency Program Manager Brian Sewell of MMWEC stands next to a 2017 Nissan Leaf. 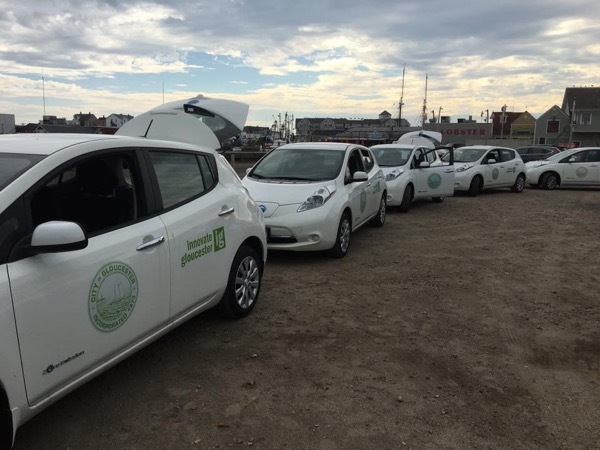 Marblehead Municipal Light Department(MMLD) is offering an EV program to residents looking to take advantage of special incentives from Nissan, as well as a free level 2 Wi-Fi charger courtesy of MMLD. 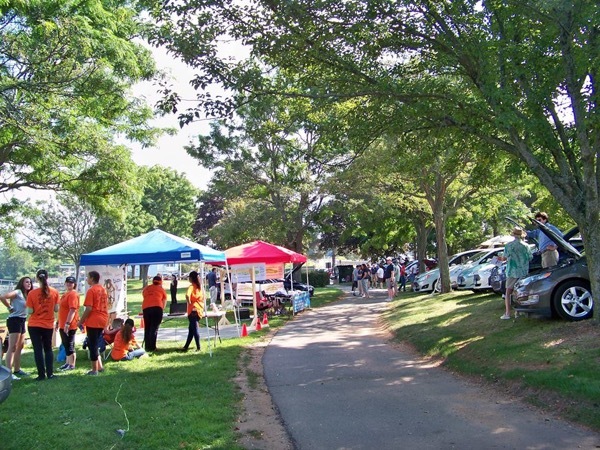 © 2017 Marblehead Municipal Light Department and MMWEC: permission is granted to use this photo to report, support or promote National Drive Electric Week events provided photo credit is given as shown above. All other uses prohibited unless written permission is granted by the owner. © 2017 Michelle Porche: permission is granted to use this photo to report, support or promote National Drive Electric Week events provided photo credit is given as shown above. All other uses prohibited unless written permission is granted by the owner. 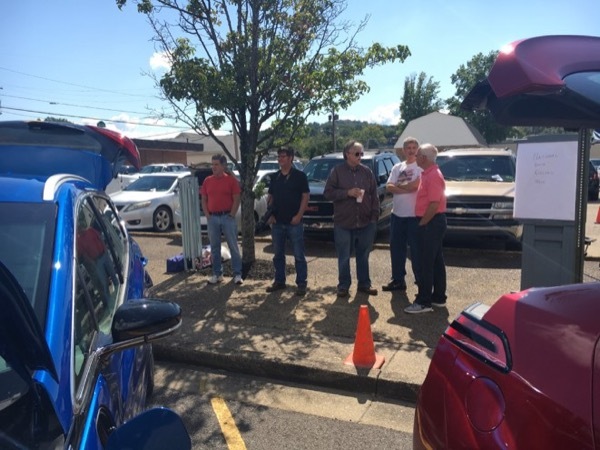 © 2017 Mid-South EV Club: permission is granted to use this photo to report, support or promote National Drive Electric Week events provided photo credit is given as shown above. All other uses prohibited unless written permission is granted by the owner. © 2017 Alex Brown: permission is granted to use this photo to report, support or promote National Drive Electric Week events provided photo credit is given as shown above. All other uses prohibited unless written permission is granted by the owner. 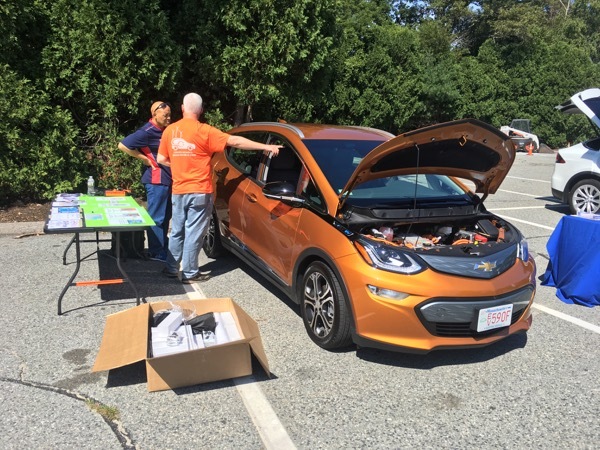 © 2017 NEEAA: permission is granted to use this photo to report, support or promote National Drive Electric Week events provided photo credit is given as shown above. All other uses prohibited unless written permission is granted by the owner. 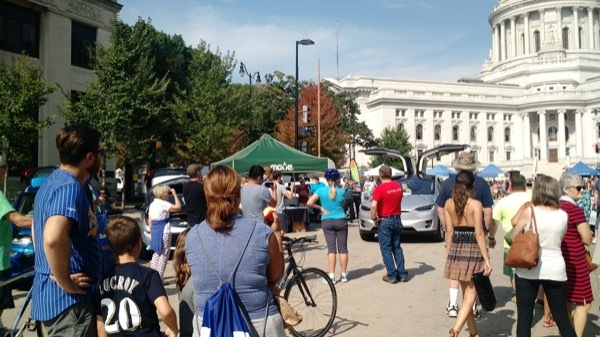 © 2017 Wisconsin Clean Cities: permission is granted to use this photo to report, support or promote National Drive Electric Week events provided photo credit is given as shown above. All other uses prohibited unless written permission is granted by the owner. 1 Mitsubishi i-Miev and 1 Chevy Volt. 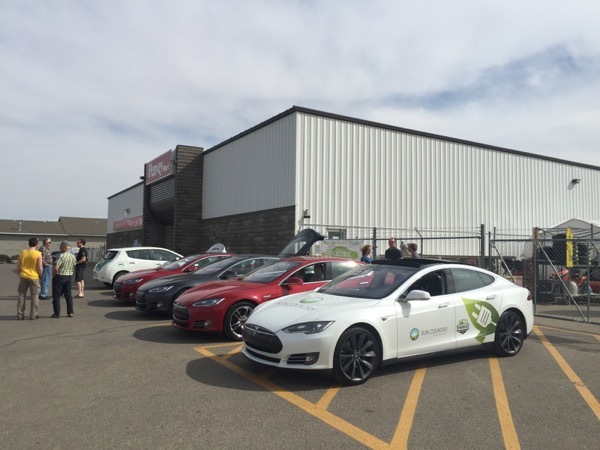 © 2017 Paul MacDonald: permission is granted to use this photo to report, support or promote National Drive Electric Week events provided photo credit is given as shown above. All other uses prohibited unless written permission is granted by the owner. 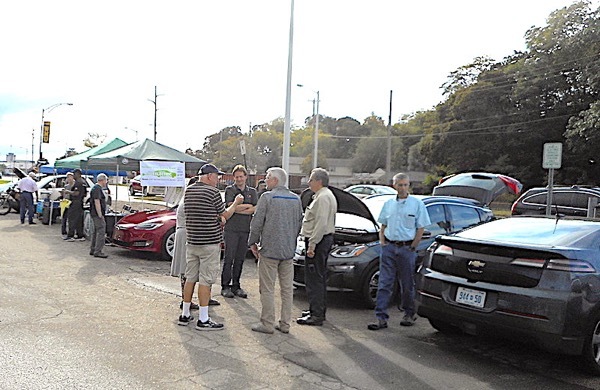 This was the group of EV's at our Moose Jaw event..
© 2017 Sound Solar Systems Inc.. www.soundsolar.ca: permission is granted to use this photo to report, support or promote National Drive Electric Week events provided photo credit is given as shown above. All other uses prohibited unless written permission is granted by the owner. © 2017 Chris Neff: permission is granted to use this photo to report, support or promote National Drive Electric Week events provided photo credit is given as shown above. All other uses prohibited unless written permission is granted by the owner. 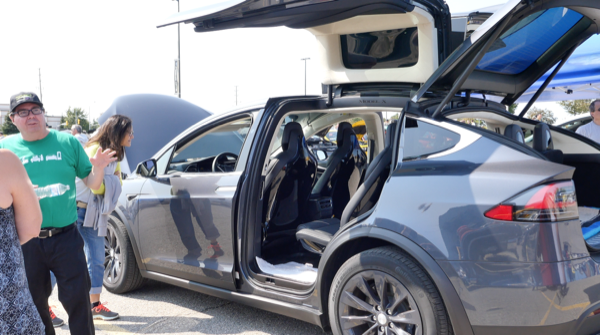 Jason Barnes and his Tesla Model X, Leslie Park in the Model X. Standing in the background Charlotte Omoto, Rachel Clark. Can't see well in the background are two more Tesla Model S, Nissan Leaf and a Toyota Prius Prime. 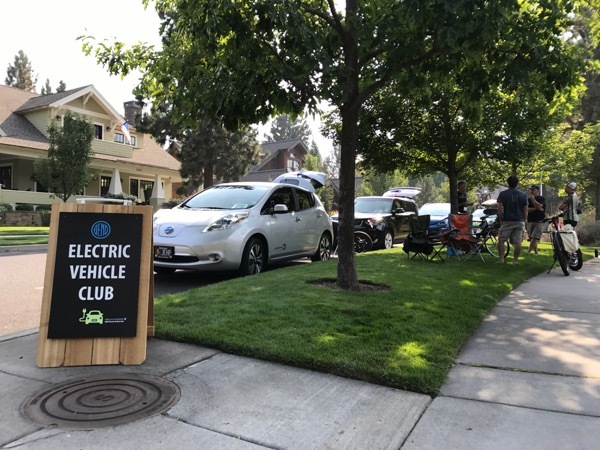 © 2017 Doug Park: permission is granted to use this photo to report, support or promote National Drive Electric Week events provided photo credit is given as shown above. All other uses prohibited unless written permission is granted by the owner. 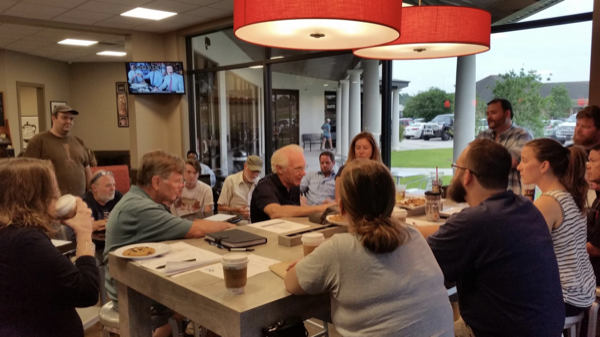 This is a Picture showing a good idea of Attendance. More pictures to come! © 2017 Kent Sheltom: permission is granted to use this photo to report, support or promote National Drive Electric Week events provided photo credit is given as shown above. All other uses prohibited unless written permission is granted by the owner. © 2017 Bruce Jones: permission is granted to use this photo to report, support or promote National Drive Electric Week events provided photo credit is given as shown above. All other uses prohibited unless written permission is granted by the owner. 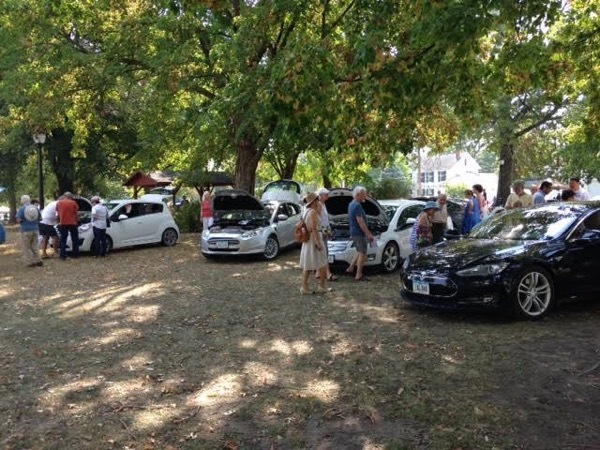 We had around 14 EVs, presented mostly by owners, at Natick Common. 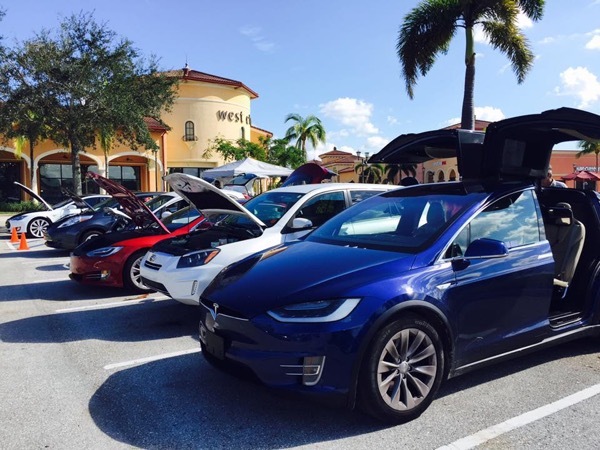 cars Present included Tesla, E-Golf, Leaf, Kia, Volt, Ford Focus, and several other models. © 2017 May Arthur: permission is granted to use this photo to report, support or promote National Drive Electric Week events provided photo credit is given as shown above. All other uses prohibited unless written permission is granted by the owner. 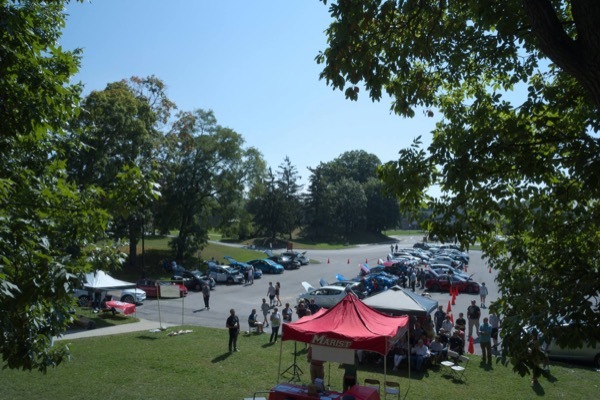 This is a view from the road to the campus where we had the tent set up and plug-ins at the charger stations and along the left row of parking spaces. 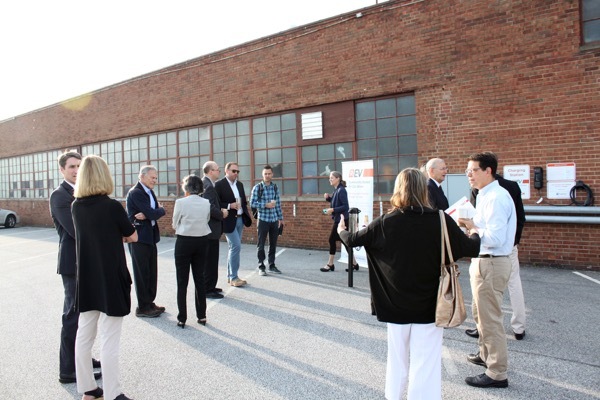 Great location for our NDEW event! 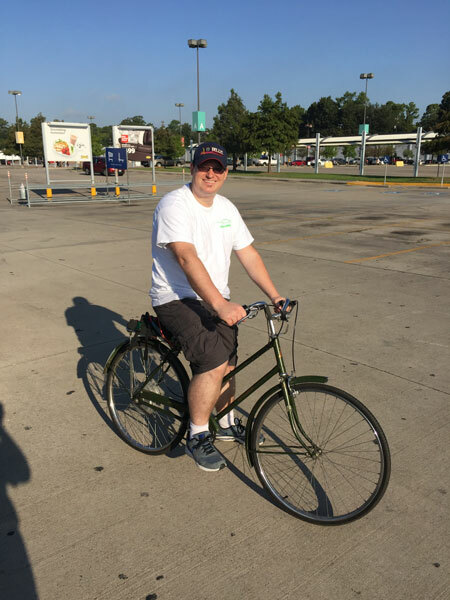 © 2017 New Orleans group of Sierra Club: permission is granted to use this photo to report, support or promote National Drive Electric Week events provided photo credit is given as shown above. All other uses prohibited unless written permission is granted by the owner. 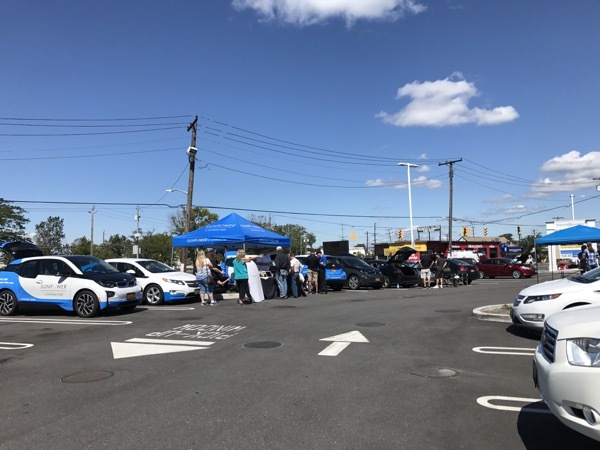 © 2017 Concept 13 Studios, LLC: permission is granted to use this photo to report, support or promote National Drive Electric Week events provided photo credit is given as shown above. All other uses prohibited unless written permission is granted by the owner. © 2017 Kat Fisher: permission is granted to use this photo to report, support or promote National Drive Electric Week events provided photo credit is given as shown above. All other uses prohibited unless written permission is granted by the owner. too many people. 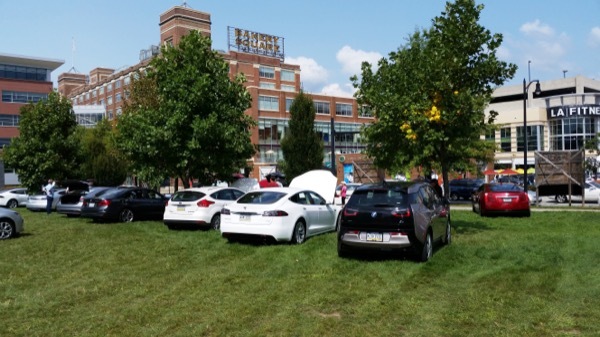 Tesla z, Nissan Leaf, VW e-Golf, Chevy Bolt, BMW i3. 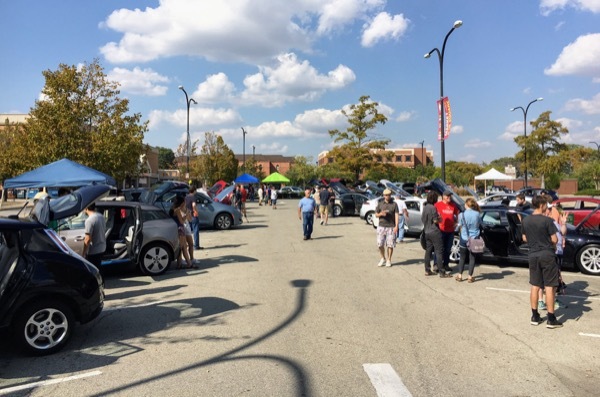 © 2017 Drew Shaw, Montgomery County Planning Commission: permission is granted to use this photo to report, support or promote National Drive Electric Week events provided photo credit is given as shown above. All other uses prohibited unless written permission is granted by the owner. 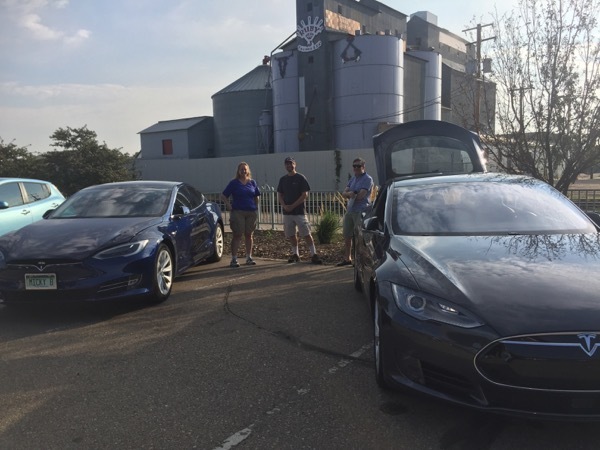 © 2017 Eric Pollard, Association of Central Oklahoma Governments: permission is granted to use this photo to report, support or promote National Drive Electric Week events provided photo credit is given as shown above. All other uses prohibited unless written permission is granted by the owner. We took over the farthest South parking section for the Plug-ins. 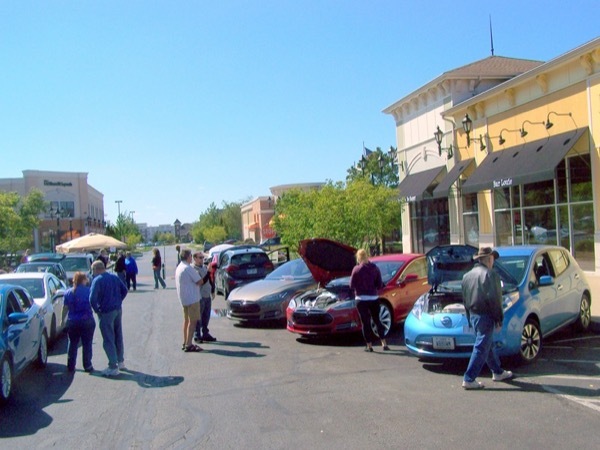 Here you can see the EVs, our display table, and the store in the background. Big Y has been very sportive of EVs. They installed a two-station charger right in front of this new store and we're told that the president of this New England grocery chain drives Model S! © 2017 D.E. Corbin, Vice-Chair, Nebraska Sierra Club: permission is granted to use this photo to report, support or promote National Drive Electric Week events provided photo credit is given as shown above. All other uses prohibited unless written permission is granted by the owner. © 2017 Bob Mason: permission is granted to use this photo to report, support or promote National Drive Electric Week events provided photo credit is given as shown above. All other uses prohibited unless written permission is granted by the owner. Chevy Bolt with crowd in background. © 2017 Morgan Hartwig: permission is granted to use this photo to report, support or promote National Drive Electric Week events provided photo credit is given as shown above. All other uses prohibited unless written permission is granted by the owner. 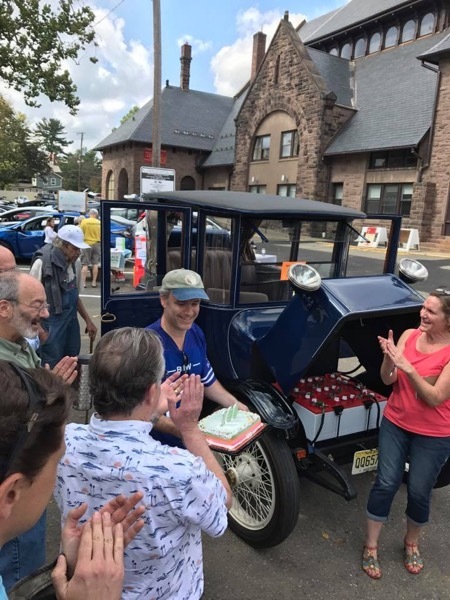 Detroit Electric 1917, BMWs, Volts, Leaf, etc. © 2017 Ace Allen: permission is granted to use this photo to report, support or promote National Drive Electric Week events provided photo credit is given as shown above. All other uses prohibited unless written permission is granted by the owner. © 2017 Warren Matsui: permission is granted to use this photo to report, support or promote National Drive Electric Week events provided photo credit is given as shown above. All other uses prohibited unless written permission is granted by the owner. 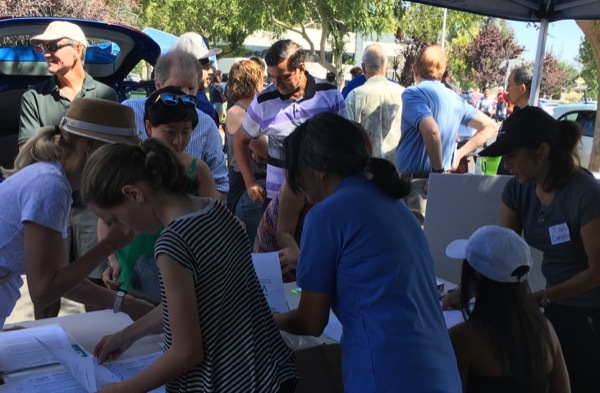 Registration volunteers worked tirelessly to process the many attendees who came to take test drives! © 2017 Acterra: permission is granted to use this photo to report, support or promote National Drive Electric Week events provided photo credit is given as shown above. All other uses prohibited unless written permission is granted by the owner. 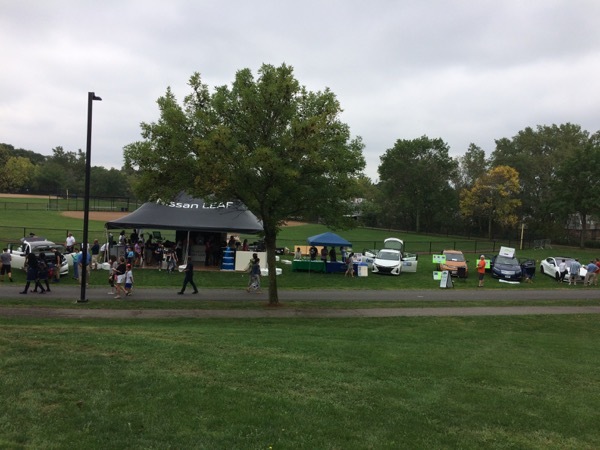 © 2017 Park Ridge Green Team: permission is granted to use this photo to report, support or promote National Drive Electric Week events provided photo credit is given as shown above. All other uses prohibited unless written permission is granted by the owner. © 2017 Michael Hall: permission is granted to use this photo to report, support or promote National Drive Electric Week events provided photo credit is given as shown above. All other uses prohibited unless written permission is granted by the owner. © 2017 Michael Kirven: permission is granted to use this photo to report, support or promote National Drive Electric Week events provided photo credit is given as shown above. All other uses prohibited unless written permission is granted by the owner. 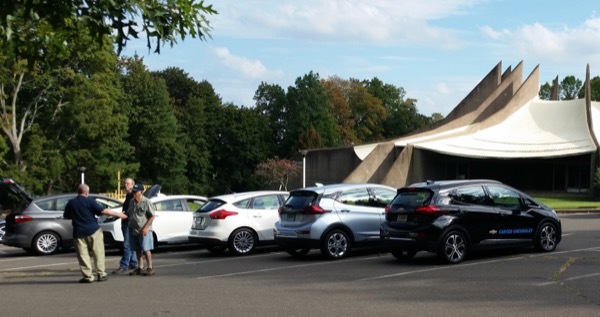 Electric Vehicles from right to left (Silver Model X, Blue Chevy Bolt, Silver BMW i3). 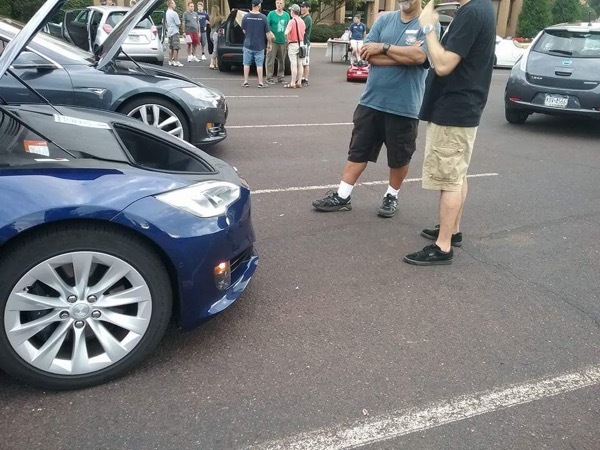 Model S is not visible. 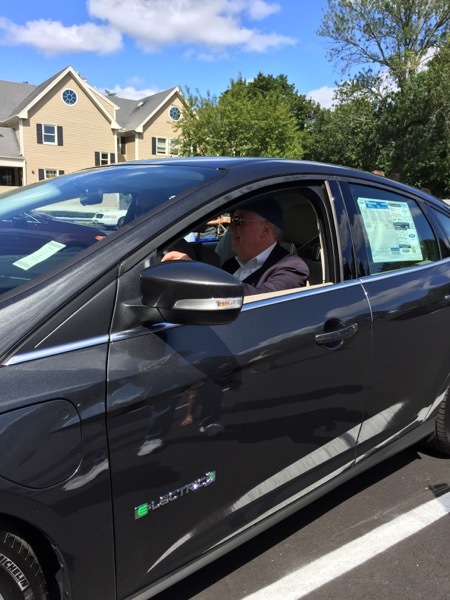 © 2017 Ben Serebin: permission is granted to use this photo to report, support or promote National Drive Electric Week events provided photo credit is given as shown above. All other uses prohibited unless written permission is granted by the owner. 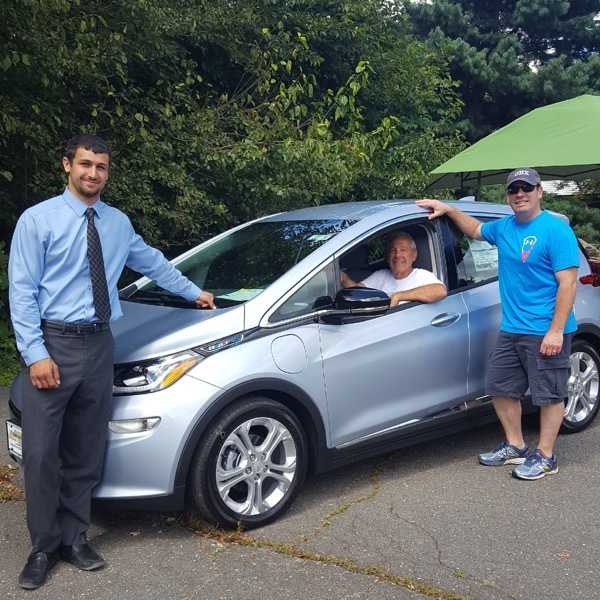 John Fitzmaurice with his Chevrolet Bolt. © 2017 Vince Carrington: permission is granted to use this photo to report, support or promote National Drive Electric Week events provided photo credit is given as shown above. All other uses prohibited unless written permission is granted by the owner. 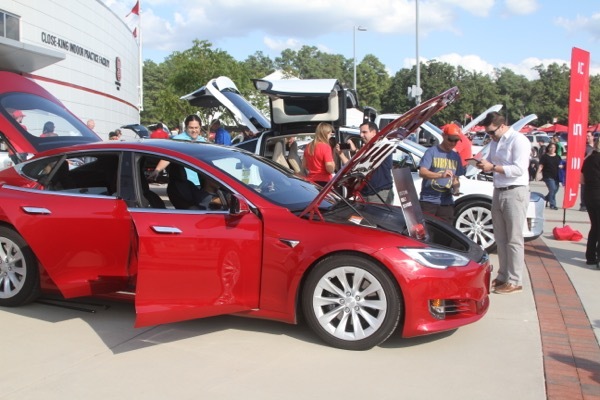 An incredible Tesla Model S painted the rare "signature red" color is displayed as event attendees walk in the background. 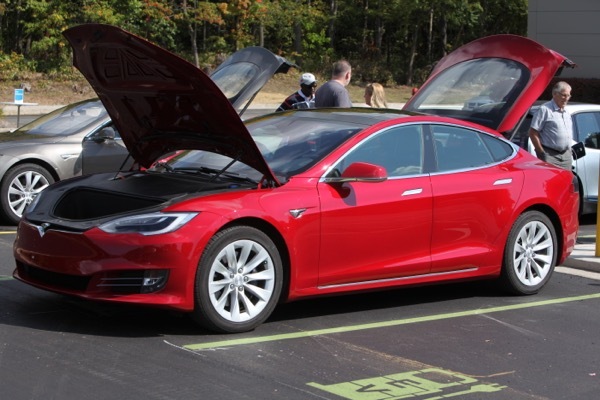 This particular Tesla was one of the first 1000 Model S ever manufactured, and was the first one to be registered in the State of Michigan in 2015. 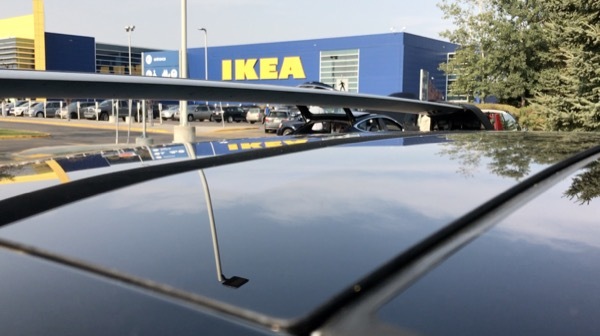 © 2017 Freudenberg-NOK Sealing Technologies: permission is granted to use this photo to report, support or promote National Drive Electric Week events provided photo credit is given as shown above. All other uses prohibited unless written permission is granted by the owner. © 2017 Seth Wheeler: permission is granted to use this photo to report, support or promote National Drive Electric Week events provided photo credit is given as shown above. All other uses prohibited unless written permission is granted by the owner. 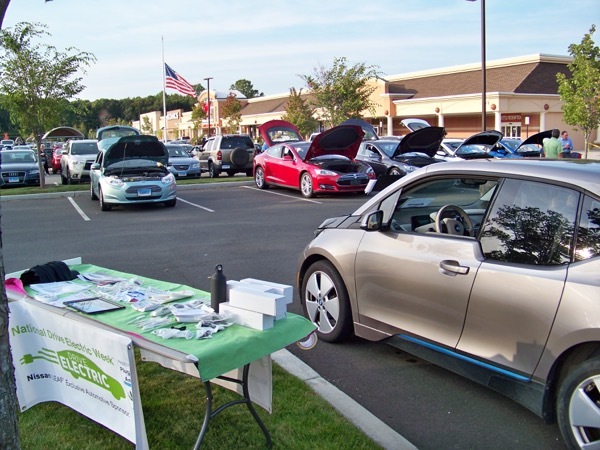 © 2017 Poolesville.Green - JD Taylor: permission is granted to use this photo to report, support or promote National Drive Electric Week events provided photo credit is given as shown above. All other uses prohibited unless written permission is granted by the owner. © 2017 Patrick Conner, OEVA: permission is granted to use this photo to report, support or promote National Drive Electric Week events provided photo credit is given as shown above. All other uses prohibited unless written permission is granted by the owner. © 2017 James Penfold: permission is granted to use this photo to report, support or promote National Drive Electric Week events provided photo credit is given as shown above. All other uses prohibited unless written permission is granted by the owner. Nobody is discernible. 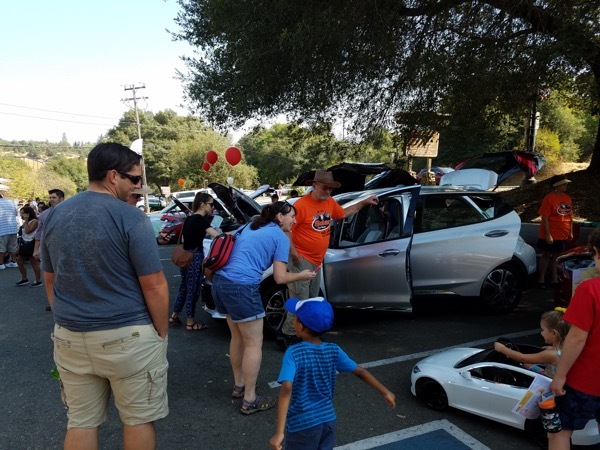 There are a few Tesla Model X & Model S's, as well as a few Bolts, a handful of Volts, a gaggle of LEAFs and two Prius plugins. 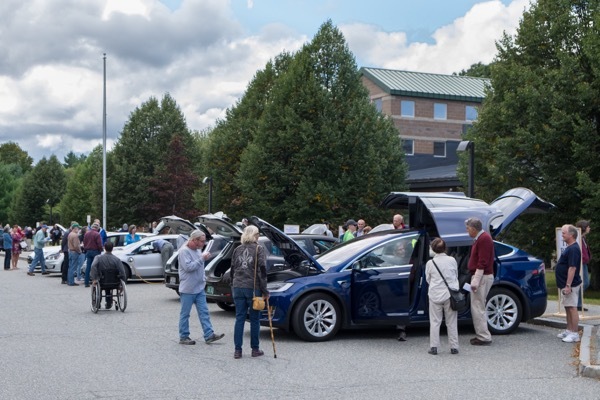 © 2017 Hudson Valley Electric Vehicle Owners Group: permission is granted to use this photo to report, support or promote National Drive Electric Week events provided photo credit is given as shown above. All other uses prohibited unless written permission is granted by the owner. 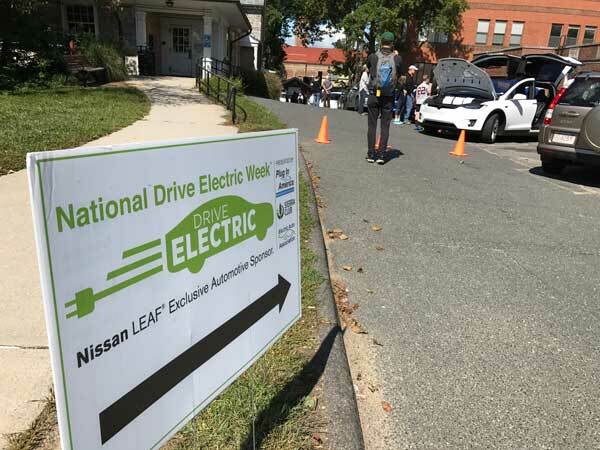 © 2017 Katherine Stainken: permission is granted to use this photo to report, support or promote National Drive Electric Week events provided photo credit is given as shown above. All other uses prohibited unless written permission is granted by the owner. 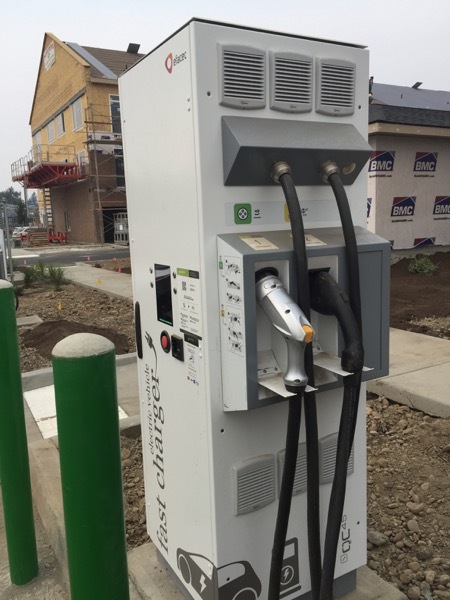 City of Quincy Mayor Tom Koch discusses Quincy's plans to install electric vehicle charging stations in future municipal projects. City Councillor Noel DiBona and Energy and Sustainability Director Shelly Dein, listening, as well as members of the general public. Chevrolet Bolt and Nissan Leaf in photo as well. 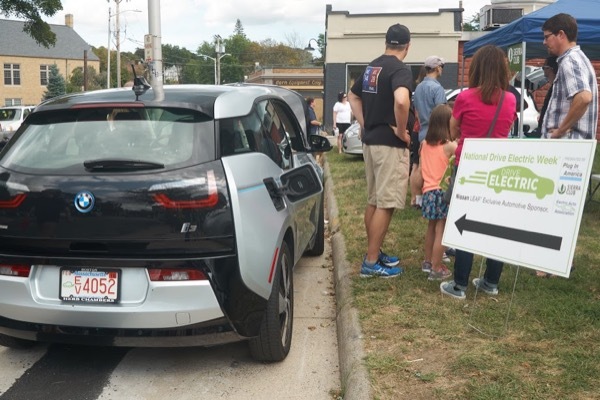 © 2017 Lisa Aimola, Quincy Community Preservation Director: permission is granted to use this photo to report, support or promote National Drive Electric Week events provided photo credit is given as shown above. All other uses prohibited unless written permission is granted by the owner. © 2017 Alan Long: permission is granted to use this photo to report, support or promote National Drive Electric Week events provided photo credit is given as shown above. All other uses prohibited unless written permission is granted by the owner. 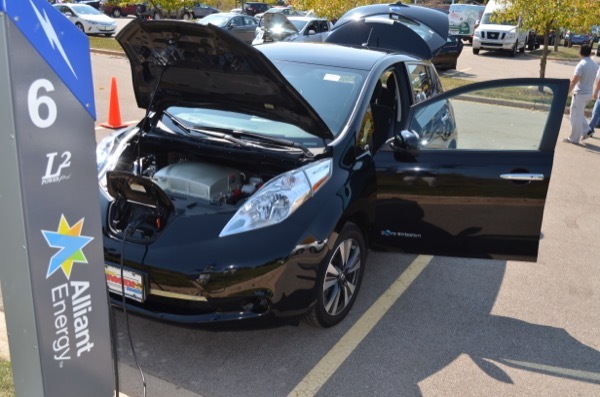 © 2017 Connexus Energy and Drive Electric Minnesota: permission is granted to use this photo to report, support or promote National Drive Electric Week events provided photo credit is given as shown above. All other uses prohibited unless written permission is granted by the owner. 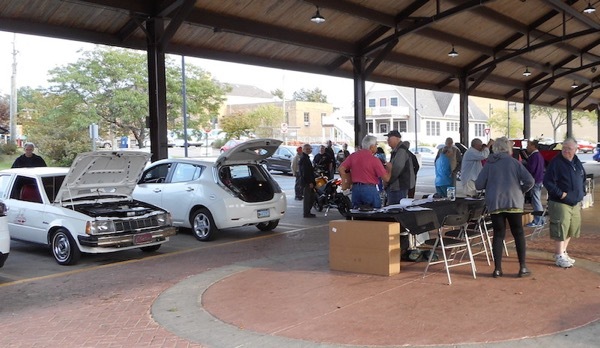 The Black Hills-DRA booth at the Rapid City Farmers Market with our two EV's shown. 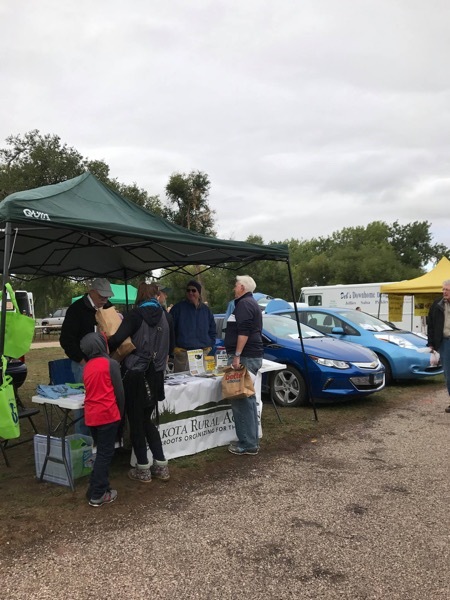 © 2017 Cheryl Rowe, Organizer of Black Hills Chapter-Dakota Rural Action (DRA): permission is granted to use this photo to report, support or promote National Drive Electric Week events provided photo credit is given as shown above. All other uses prohibited unless written permission is granted by the owner. 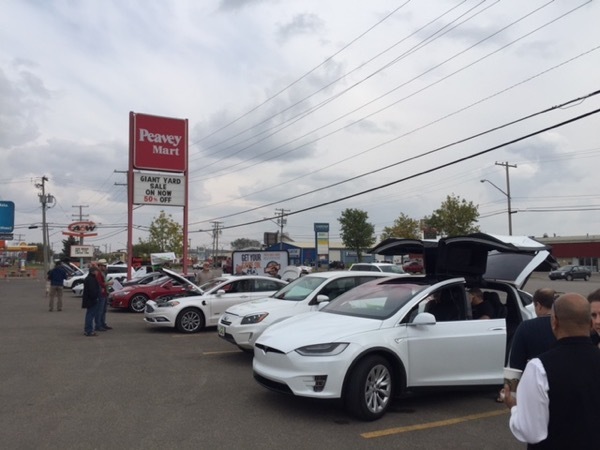 Peavey Mart is a big supporter of EV charging in Western Canada... Every location has one or more. 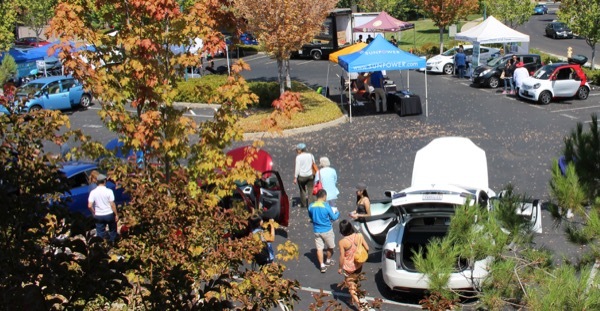 © 2017 Sound Solar Systems Inc.. www.soundsolar.cad: permission is granted to use this photo to report, support or promote National Drive Electric Week events provided photo credit is given as shown above. All other uses prohibited unless written permission is granted by the owner. Mayor Paul Kuhns, Commissioners Kathy McGuiness, Stan Mills, and Lisa Schlosser -joined by several non-official citizens Hoyt and Paul. © 2017 Charlie Garlow: permission is granted to use this photo to report, support or promote National Drive Electric Week events provided photo credit is given as shown above. All other uses prohibited unless written permission is granted by the owner. 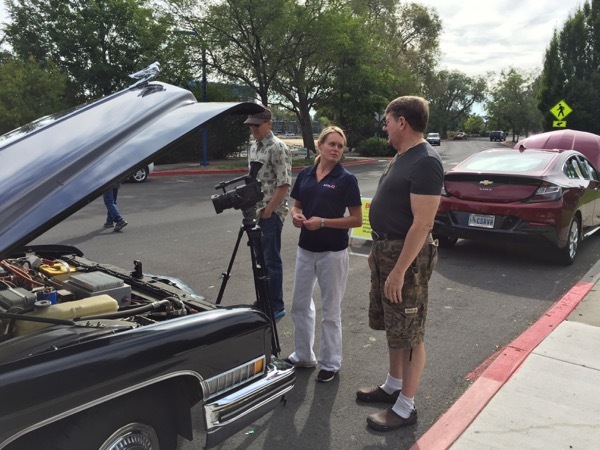 KOLO-TV, Reno, NV learns about electric cars from William Brinsmead of Reno, NV. He was at the NDEW with his 1972 Cadillac Hearse conversion - a familiar sight around the area. © 2017 Cynthia S. Ryan: permission is granted to use this photo to report, support or promote National Drive Electric Week events provided photo credit is given as shown above. All other uses prohibited unless written permission is granted by the owner. 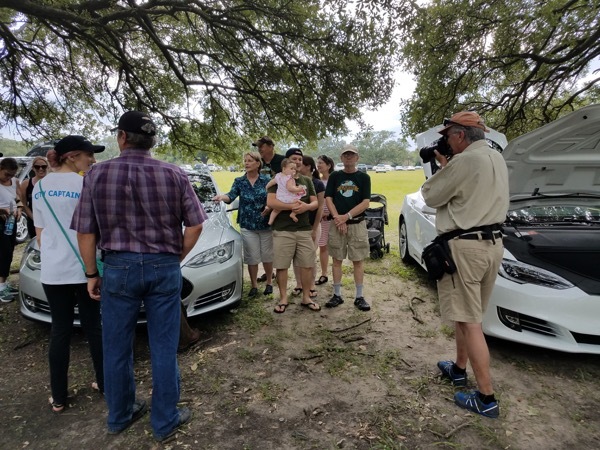 Panoramic photo of all people and cars. 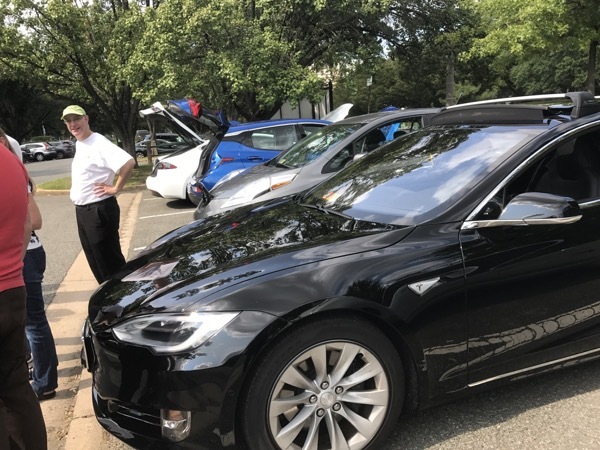 © 2017 William Peterson, VP of MCEVA: permission is granted to use this photo to report, support or promote National Drive Electric Week events provided photo credit is given as shown above. All other uses prohibited unless written permission is granted by the owner. © 2017 Allyson Gardner, Clean Vehicle Rebate Project: permission is granted to use this photo to report, support or promote National Drive Electric Week events provided photo credit is given as shown above. All other uses prohibited unless written permission is granted by the owner. 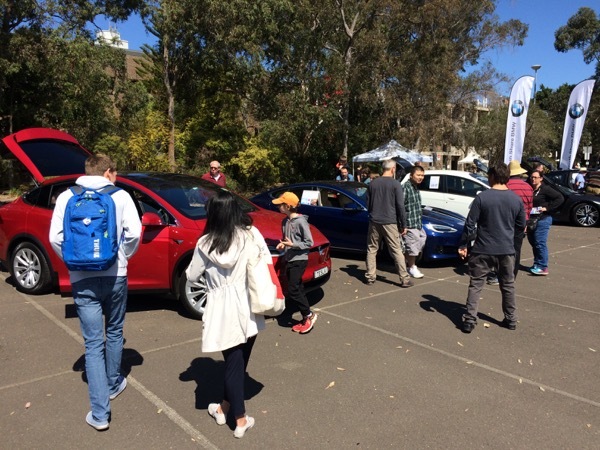 Local EV owners explained the benefits of their cars to many interested visitors. © 2017 Humphrey Liu: permission is granted to use this photo to report, support or promote National Drive Electric Week events provided photo credit is given as shown above. All other uses prohibited unless written permission is granted by the owner. 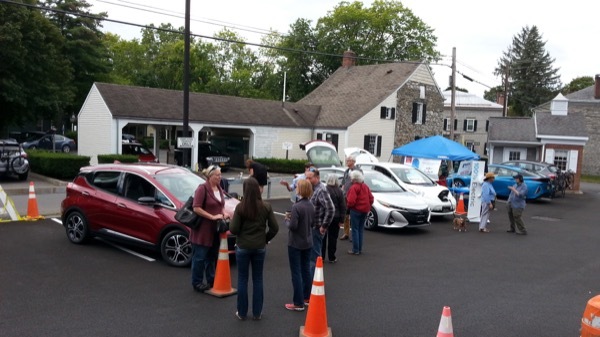 © 2017 Sierra Club Long Island Chapter: permission is granted to use this photo to report, support or promote National Drive Electric Week events provided photo credit is given as shown above. All other uses prohibited unless written permission is granted by the owner. © 2017 Jessica Sutorus: permission is granted to use this photo to report, support or promote National Drive Electric Week events provided photo credit is given as shown above. All other uses prohibited unless written permission is granted by the owner. Tesla Signature Red Model S, Silver Model S, Model X and Chevy Volt. © 2017 Patrick Adam Lawson: permission is granted to use this photo to report, support or promote National Drive Electric Week events provided photo credit is given as shown above. All other uses prohibited unless written permission is granted by the owner. © 2017 Bob Kanauer: permission is granted to use this photo to report, support or promote National Drive Electric Week events provided photo credit is given as shown above. All other uses prohibited unless written permission is granted by the owner. © 2017 Dave Talboys - Talboys Photography: permission is granted to use this photo to report, support or promote National Drive Electric Week events provided photo credit is given as shown above. All other uses prohibited unless written permission is granted by the owner. 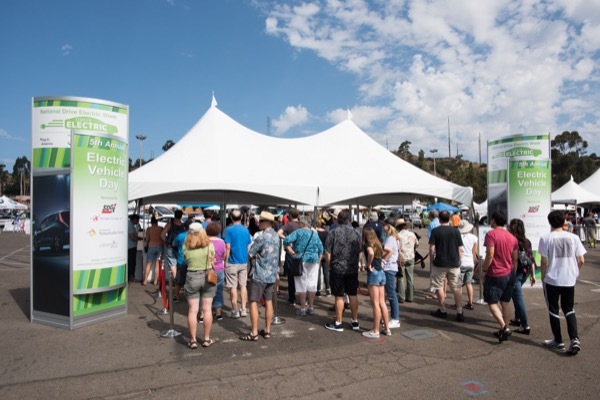 Hundreds of people attended the 2017 San Diego National Drive Electric Week event. 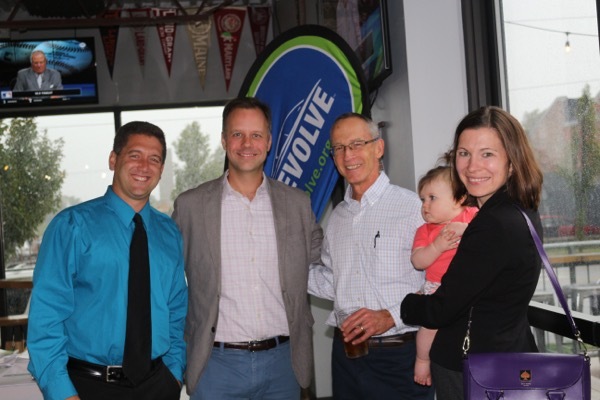 © 2017 Lauren Radack Photography: permission is granted to use this photo to report, support or promote National Drive Electric Week events provided photo credit is given as shown above. All other uses prohibited unless written permission is granted by the owner. 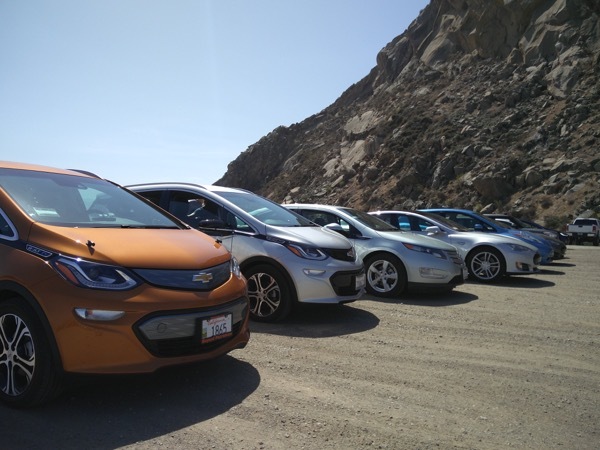 Two Chevy Bolts, a Volt, a Tesla S and several others at Morro Rock. © 2017 Brennan Balson: permission is granted to use this photo to report, support or promote National Drive Electric Week events provided photo credit is given as shown above. All other uses prohibited unless written permission is granted by the owner. © 2017 Mei Wan: permission is granted to use this photo to report, support or promote National Drive Electric Week events provided photo credit is given as shown above. All other uses prohibited unless written permission is granted by the owner. 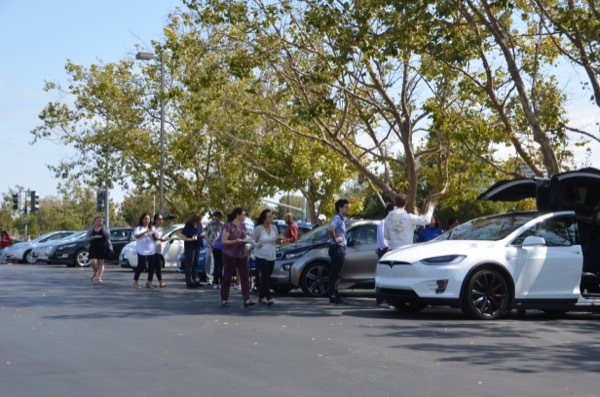 Marketo employees and neighbors enjoy lunch and a selection of EVs, including two Chevrolet Bolts, three Chevrolet Volts, a Chevy Spark, a Nissan Leaf, a Fiat 500e, a VW e-Golf, a BMW i3, and a Tesla Model X. © 2017 Candice Tandiono: permission is granted to use this photo to report, support or promote National Drive Electric Week events provided photo credit is given as shown above. All other uses prohibited unless written permission is granted by the owner. 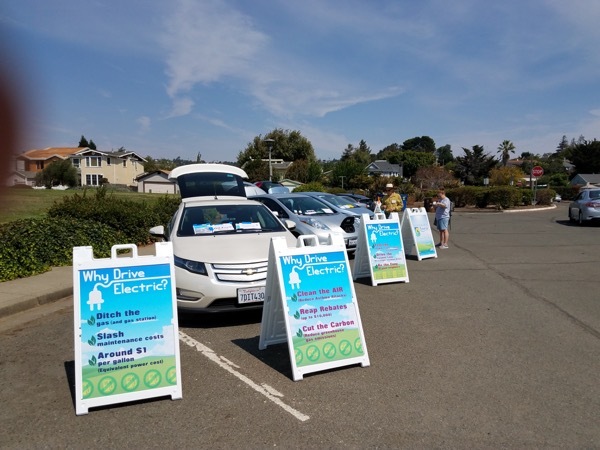 © 2017 Ecology Action: permission is granted to use this photo to report, support or promote National Drive Electric Week events provided photo credit is given as shown above. All other uses prohibited unless written permission is granted by the owner. 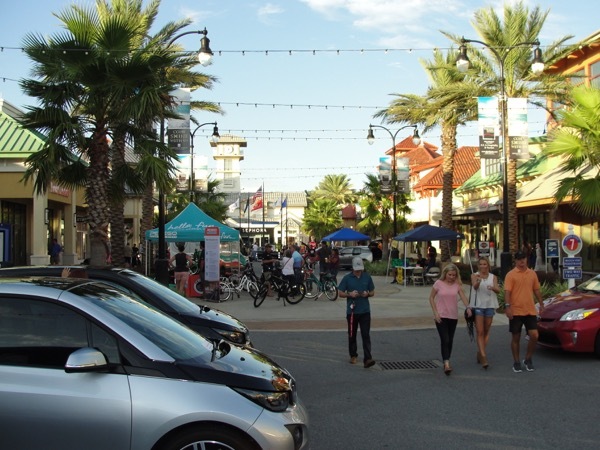 © 2017 Clint Beasley - Space Coast EV Drivers: permission is granted to use this photo to report, support or promote National Drive Electric Week events provided photo credit is given as shown above. All other uses prohibited unless written permission is granted by the owner. This drone photo really captures the scale of the event, although in this early morning photo the foot traffic was still light. Once the Greek and Little Italy Festivals around the corners commenced, we had a steady flow of people visiting all afternoon. 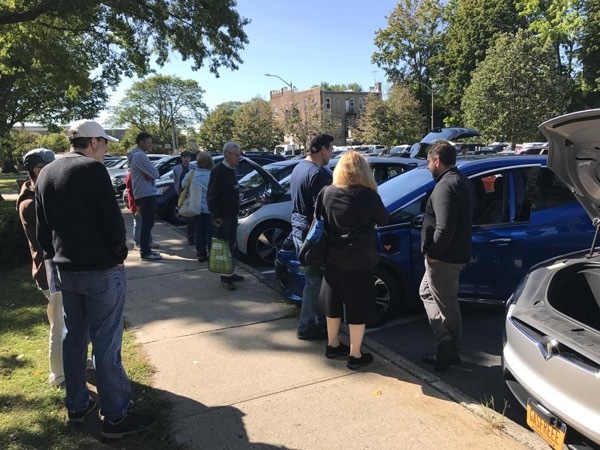 There were five demo EVs which provided test drives all day The event was scheduled to end at 3:00 pm but we were so busy that we kept it going until 4:30 pm. 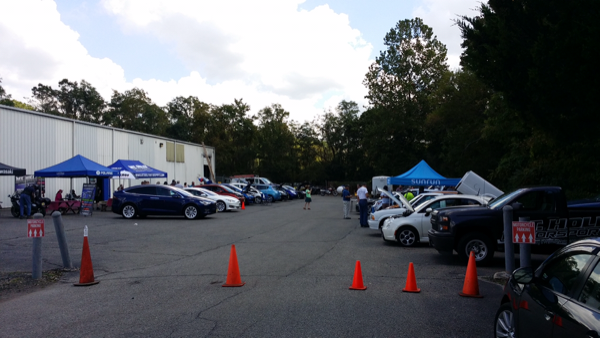 In addition to virtually every commercially available EV on the market, we had some great specialty EVs as well. Those included a 1965 Porsche 904 fiberglass replica pure EV, a custom Fat Bike that L2 charged on site, and a rare [not yet available in the US] BMW C-evolution scooter. Proterra brought a 40 passenger E2 electric bus and provided narrated and complimentary rides transiting people between our show, parking garages, and the various festivals. © 2017 Glenn Marcucio: permission is granted to use this photo to report, support or promote National Drive Electric Week events provided photo credit is given as shown above. All other uses prohibited unless written permission is granted by the owner. The Tesla S 90D 1st with Vegan interior that inspired Tesla to always offer that option. © 2017 Martina Torge: permission is granted to use this photo to report, support or promote National Drive Electric Week events provided photo credit is given as shown above. All other uses prohibited unless written permission is granted by the owner. 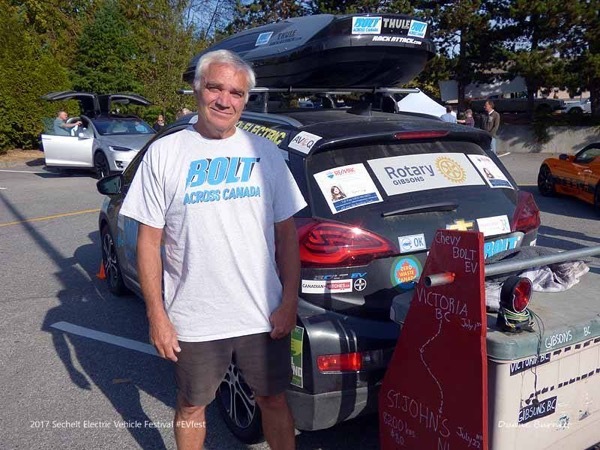 Buddy Boyd, Gibsons Recycling, who with his partner, Barb Hetherington, recently completed a cross Canada trip (and back!) Not only did they do the trip in an EV, they also complted it as a Zero Waste endeavour!) More details on this impressive achievement are available at www.BoltAcrossCanada.com. © 2017 Duane Burnett: permission is granted to use this photo to report, support or promote National Drive Electric Week events provided photo credit is given as shown above. All other uses prohibited unless written permission is granted by the owner. 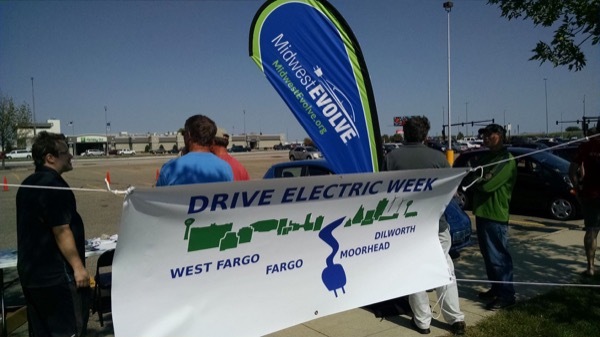 © 2017 Creighton Hejduk: permission is granted to use this photo to report, support or promote National Drive Electric Week events provided photo credit is given as shown above. All other uses prohibited unless written permission is granted by the owner. 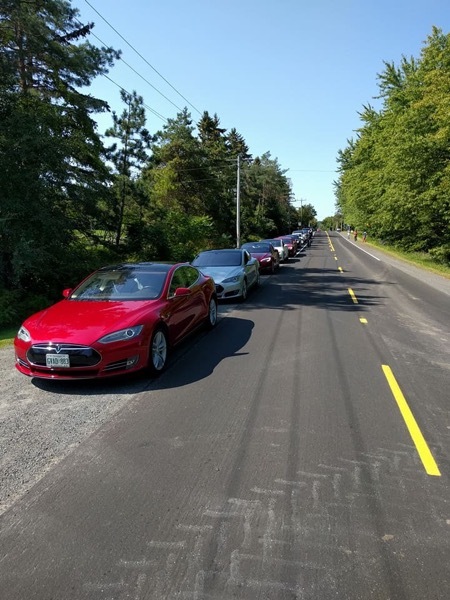 © 2017 Paul Leblond: permission is granted to use this photo to report, support or promote National Drive Electric Week events provided photo credit is given as shown above. All other uses prohibited unless written permission is granted by the owner. © 2017 Larry Harris: permission is granted to use this photo to report, support or promote National Drive Electric Week events provided photo credit is given as shown above. All other uses prohibited unless written permission is granted by the owner. The two most visible cars are a late 1980s Mercury that's been gutted and converted to an all-electric plug-in. That's the one with the open hood. 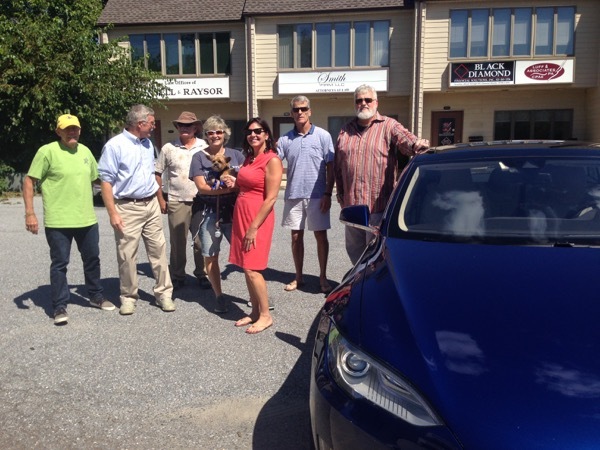 The one with the open hatchback is Paul and Anne Pancella's 2013 Nissan Leaf. 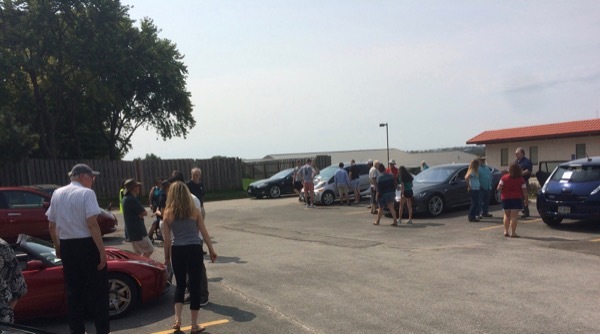 We also had two Teslas, about six other plug-ins, and three Zero Motorcycles giving demo rides around town. 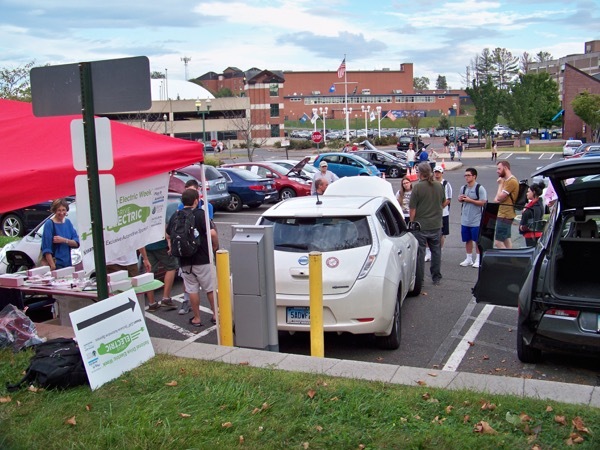 Ribbon cutting ceremony for the new solar powered EV charging stations at Oxford Hills High School. 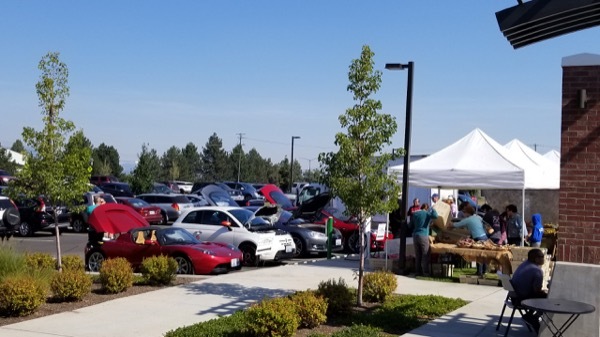 Photo taken during the EV Expo on September 16. 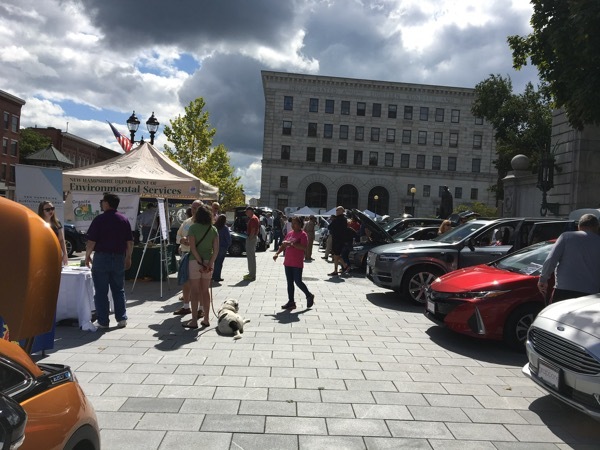 © 2017 Natural Resources Council of Maine: permission is granted to use this photo to report, support or promote National Drive Electric Week events provided photo credit is given as shown above. All other uses prohibited unless written permission is granted by the owner. 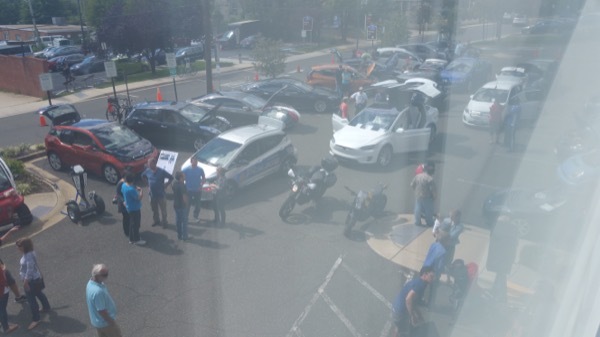 In the far back is a Chevy Spark, then a Ford Fusion, a Tessa Model S, a BMW i3, a BMW 330e and a Chevy Volt. 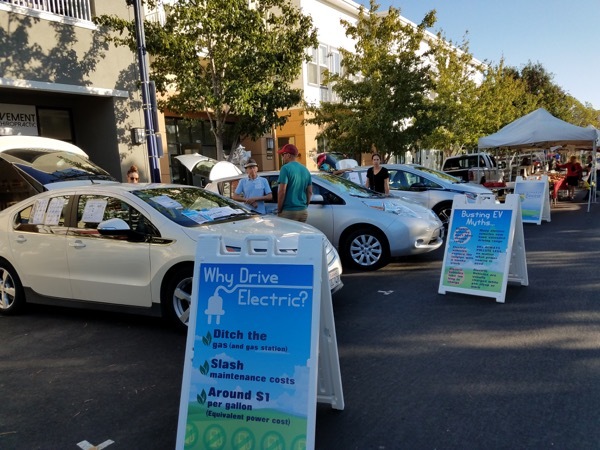 © 2017 Jenna Shimmin, City of South Pasadena: permission is granted to use this photo to report, support or promote National Drive Electric Week events provided photo credit is given as shown above. All other uses prohibited unless written permission is granted by the owner. © 2017 David Klenda: permission is granted to use this photo to report, support or promote National Drive Electric Week events provided photo credit is given as shown above. All other uses prohibited unless written permission is granted by the owner. 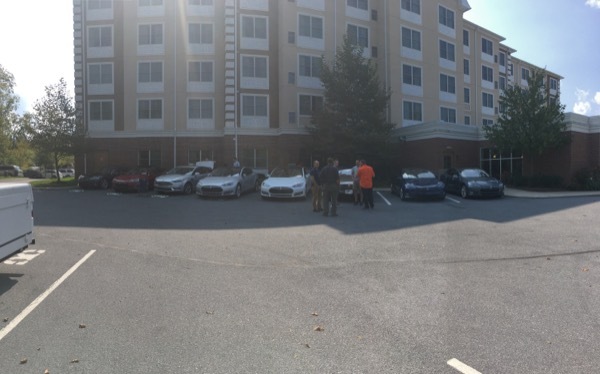 National Drive electric event in State College, Pa at the country Inn & suites. Many different electric vehicles, test drives, test rides, electric bicycles, solar powered charging provided by Sun Directed solar energy. We also had food and prizes. 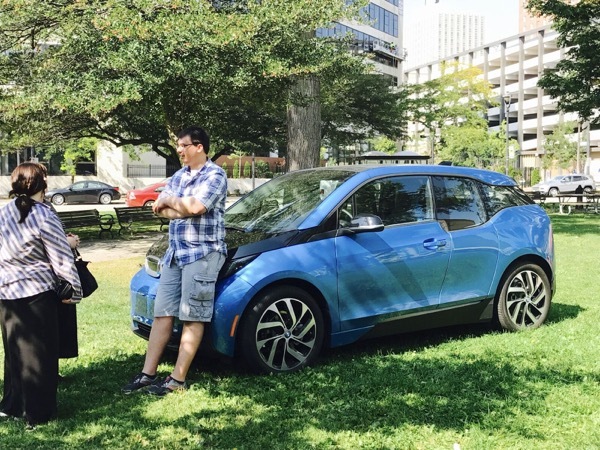 © 2017 Heather Shadow: permission is granted to use this photo to report, support or promote National Drive Electric Week events provided photo credit is given as shown above. All other uses prohibited unless written permission is granted by the owner. © 2017 Becky Morris: permission is granted to use this photo to report, support or promote National Drive Electric Week events provided photo credit is given as shown above. All other uses prohibited unless written permission is granted by the owner. 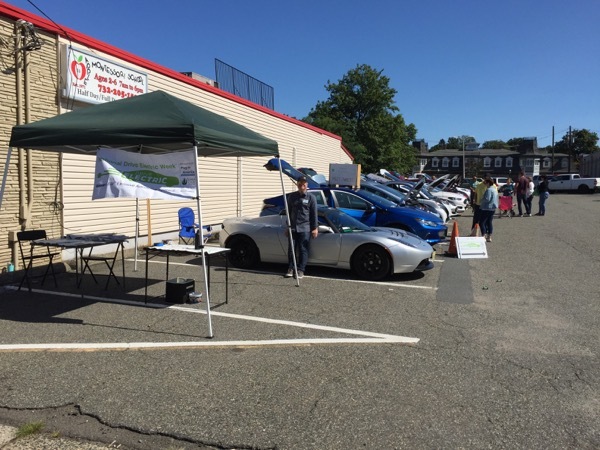 © 2017 Wayne Garver- Gateway EV club: permission is granted to use this photo to report, support or promote National Drive Electric Week events provided photo credit is given as shown above. All other uses prohibited unless written permission is granted by the owner. © 2017 Mark Taylor: permission is granted to use this photo to report, support or promote National Drive Electric Week events provided photo credit is given as shown above. All other uses prohibited unless written permission is granted by the owner. 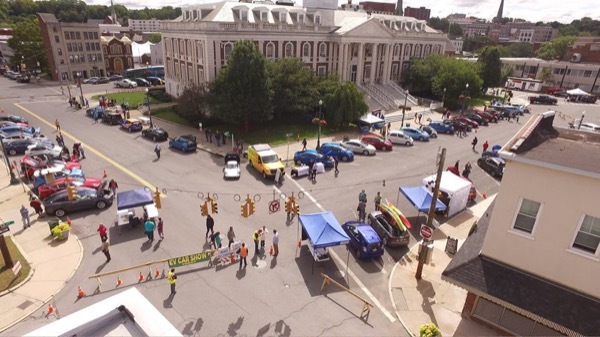 © 2017 Central New York Regional Planning and Development Board: permission is granted to use this photo to report, support or promote National Drive Electric Week events provided photo credit is given as shown above. All other uses prohibited unless written permission is granted by the owner. 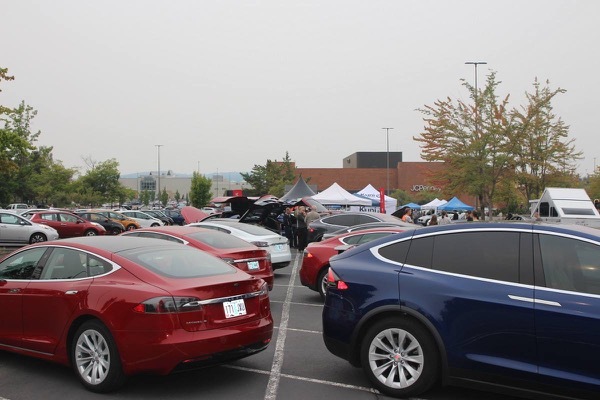 © 2017 Ken Boker (Model 3 Club President, Canada): permission is granted to use this photo to report, support or promote National Drive Electric Week events provided photo credit is given as shown above. All other uses prohibited unless written permission is granted by the owner. 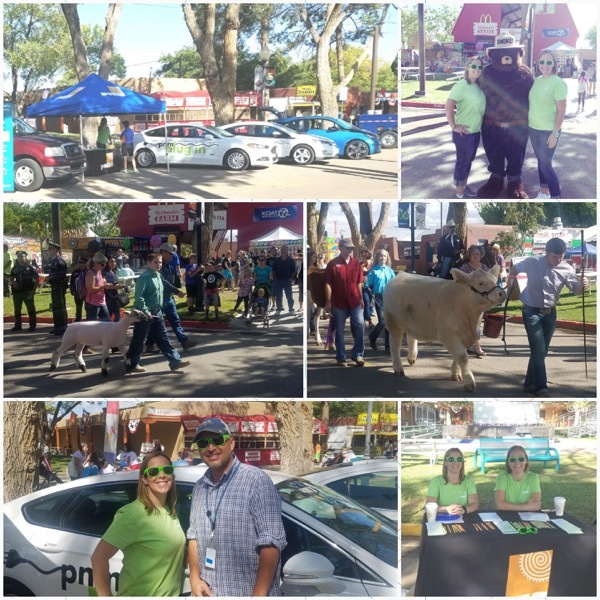 © 2017 Tucson Electric Vehicle Association: permission is granted to use this photo to report, support or promote National Drive Electric Week events provided photo credit is given as shown above. All other uses prohibited unless written permission is granted by the owner. © 2017 Sheli Weis: permission is granted to use this photo to report, support or promote National Drive Electric Week events provided photo credit is given as shown above. All other uses prohibited unless written permission is granted by the owner. 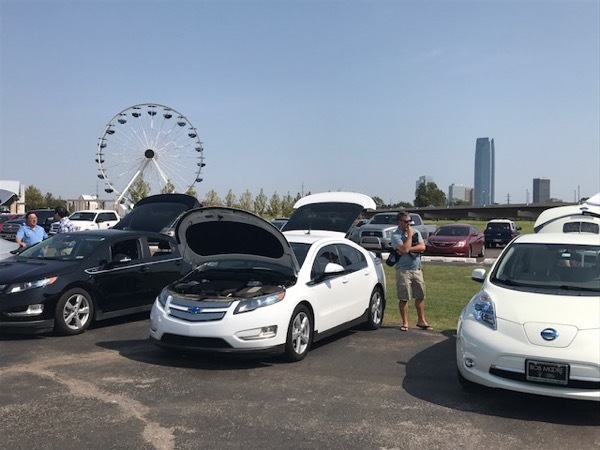 © 2017 Daniel Jeffries and Tulsa Clean Cities: permission is granted to use this photo to report, support or promote National Drive Electric Week events provided photo credit is given as shown above. All other uses prohibited unless written permission is granted by the owner. © 2017 Scott Greene: permission is granted to use this photo to report, support or promote National Drive Electric Week events provided photo credit is given as shown above. All other uses prohibited unless written permission is granted by the owner. A simple Leaf sits next to a fancy Tesla. We're all in this together! © 2017 Tracy Ceravolo: permission is granted to use this photo to report, support or promote National Drive Electric Week events provided photo credit is given as shown above. All other uses prohibited unless written permission is granted by the owner. Tesla Model S; Nissan Leaf; BMW i3; Kia Soul EV. 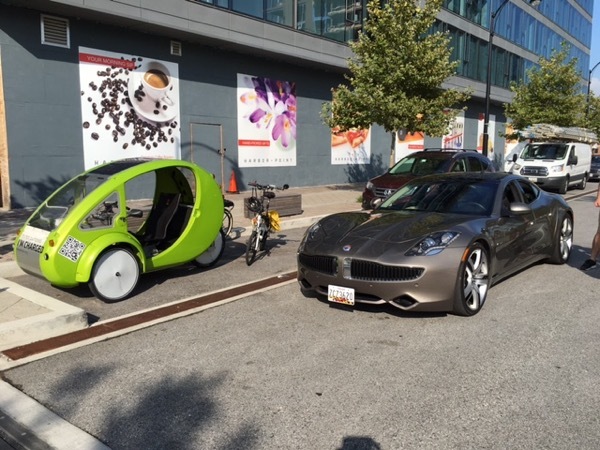 Vehicles not shown: Chevrolet Volt; Chevrolet Bolt; Mitsubishi MiEV; Smart EV; Tesla Model X; Zero motorcycle; e-bicycles. © 2017 Gloria: permission is granted to use this photo to report, support or promote National Drive Electric Week events provided photo credit is given as shown above. All other uses prohibited unless written permission is granted by the owner. © 2017 Jeff W: permission is granted to use this photo to report, support or promote National Drive Electric Week events provided photo credit is given as shown above. All other uses prohibited unless written permission is granted by the owner. © 2017 Erick Pinzon: permission is granted to use this photo to report, support or promote National Drive Electric Week events provided photo credit is given as shown above. All other uses prohibited unless written permission is granted by the owner. 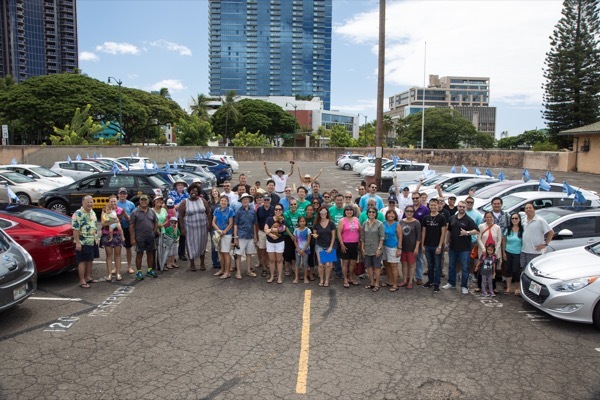 © 2017 Big Island Electric Vehicle Association: permission is granted to use this photo to report, support or promote National Drive Electric Week events provided photo credit is given as shown above. All other uses prohibited unless written permission is granted by the owner. Chev Volt - Tesla Model X - Tesla Roadster Tesla owner David Yam is seen in the black Tesla T-shirt. © 2017 Erendira Cruz: permission is granted to use this photo to report, support or promote National Drive Electric Week events provided photo credit is given as shown above. All other uses prohibited unless written permission is granted by the owner. 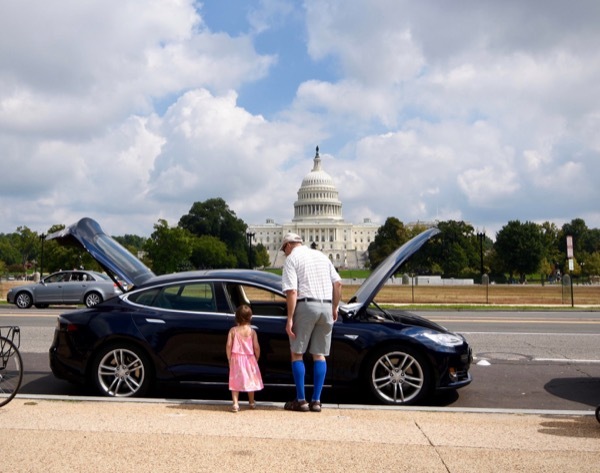 Current and next generation EV drivers? © 2017 Susan Nordeen: permission is granted to use this photo to report, support or promote National Drive Electric Week events provided photo credit is given as shown above. All other uses prohibited unless written permission is granted by the owner. © 2017 Lizette Hernandez: permission is granted to use this photo to report, support or promote National Drive Electric Week events provided photo credit is given as shown above. All other uses prohibited unless written permission is granted by the owner. 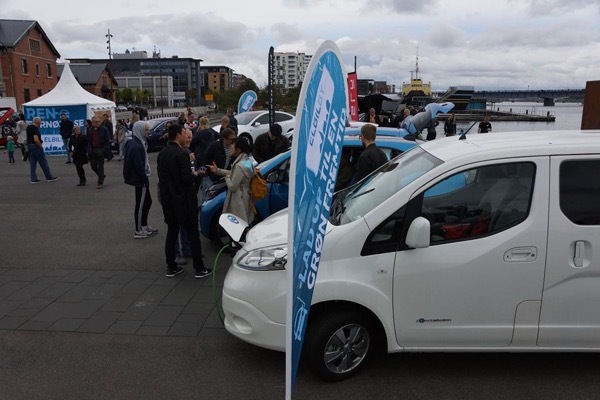 © 2017 Kaat Vander Straeten: permission is granted to use this photo to report, support or promote National Drive Electric Week events provided photo credit is given as shown above. All other uses prohibited unless written permission is granted by the owner. © 2017 Joseph Baum: permission is granted to use this photo to report, support or promote National Drive Electric Week events provided photo credit is given as shown above. All other uses prohibited unless written permission is granted by the owner. 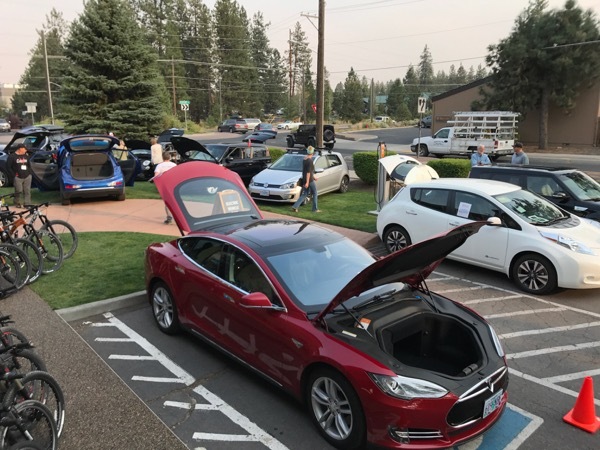 © 2017 Plug-In North Central Washington: permission is granted to use this photo to report, support or promote National Drive Electric Week events provided photo credit is given as shown above. All other uses prohibited unless written permission is granted by the owner. 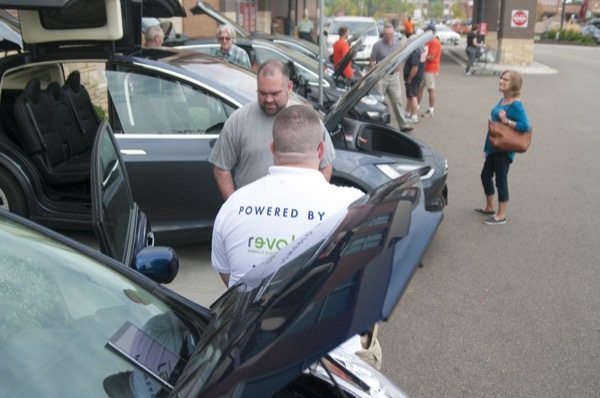 © 2017 Michael Arkwright - City Captain - Weswt Des Moines: permission is granted to use this photo to report, support or promote National Drive Electric Week events provided photo credit is given as shown above. All other uses prohibited unless written permission is granted by the owner. The BMW i3 is in the forefront. It was the ride-and-drive hit of the day. The BMW i8 doors are showing behind it. 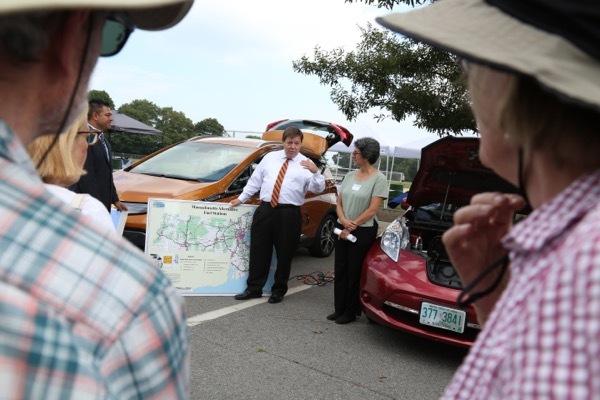 Bob Shaw from BMW of Warwick (in the hat) explains to an interested attendee the benefits of driving electric. 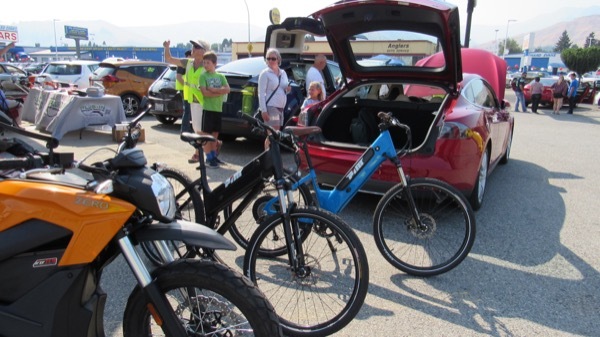 Electric bikes joined the fun. Joel Gates has a sign under the hood of his Chevy Bolt. EV Owners and Festival attendees mingle in the background. 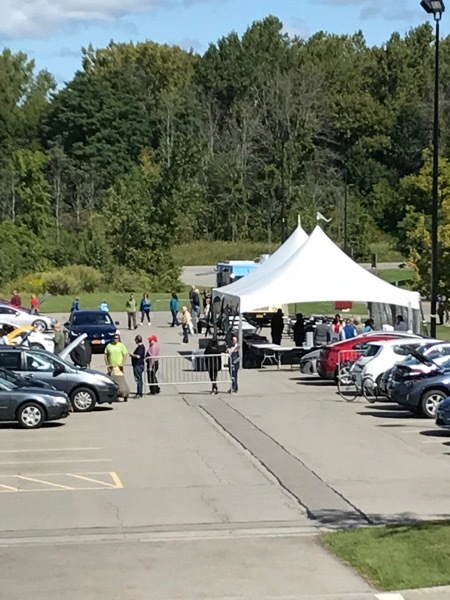 All the way to the back (right of the photo), the Toyota Prius Prime from Valenti Toyota is leaving the parking lot for a ride-and-drive. 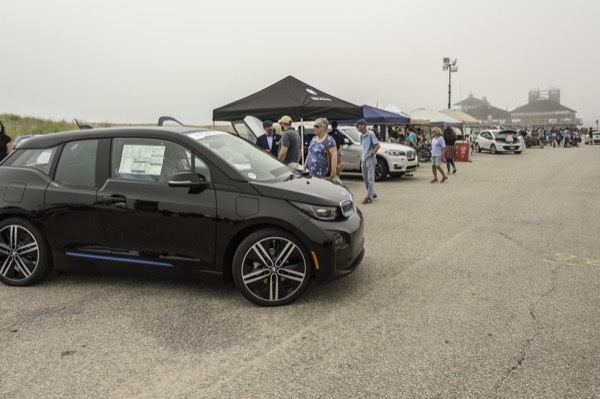 © 2017 Rhode Island Department of Environmental Management: permission is granted to use this photo to report, support or promote National Drive Electric Week events provided photo credit is given as shown above. All other uses prohibited unless written permission is granted by the owner. © 2017 Tony Muller: permission is granted to use this photo to report, support or promote National Drive Electric Week events provided photo credit is given as shown above. All other uses prohibited unless written permission is granted by the owner. 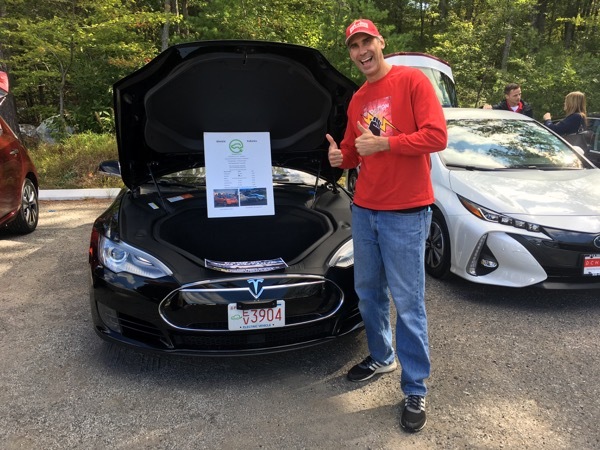 © 2017 Dave Roberts, Drive Electric Vermont: permission is granted to use this photo to report, support or promote National Drive Electric Week events provided photo credit is given as shown above. All other uses prohibited unless written permission is granted by the owner. 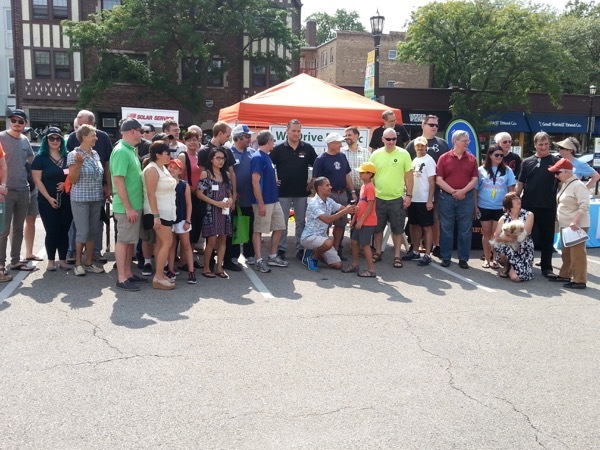 Multiple members of the Windsor Essex EV Association (not individually identifiable). Cars: Chevy Volt, Hyundai Sonata PHEV, Chrysler Pacifica e-Hybrid, Nissan Leaf, GMC Sonoma (conversion), BMW i3, Chevy Bolt EV, Ford Focus Electric. 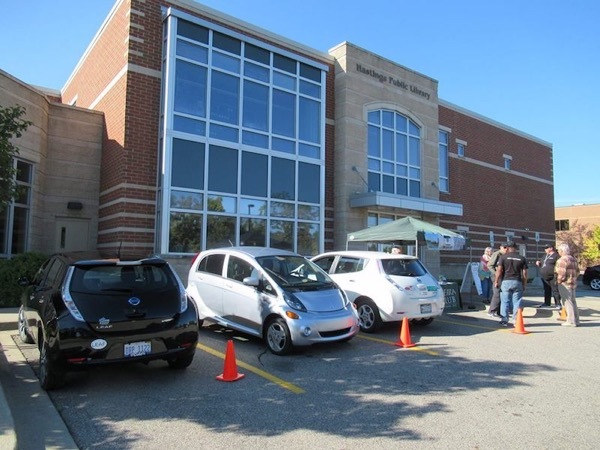 © 2017 Windsor-Essex EV Association: permission is granted to use this photo to report, support or promote National Drive Electric Week events provided photo credit is given as shown above. All other uses prohibited unless written permission is granted by the owner. LA City Controller Ron Galperin speaking about LA City's environmental goals. © 2017 Ian Taras: permission is granted to use this photo to report, support or promote National Drive Electric Week events provided photo credit is given as shown above. All other uses prohibited unless written permission is granted by the owner. No seats available as interested EV owners or potential owners listen to a panel discussion. Chevy Bolt EV on lift. 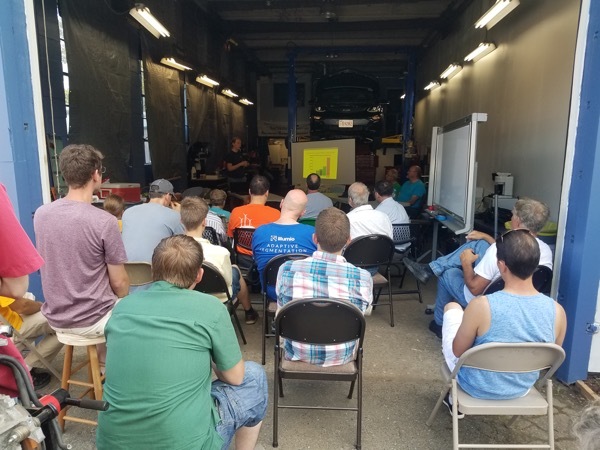 © 2017 ACDC Hybrid EV Training: permission is granted to use this photo to report, support or promote National Drive Electric Week events provided photo credit is given as shown above. All other uses prohibited unless written permission is granted by the owner. 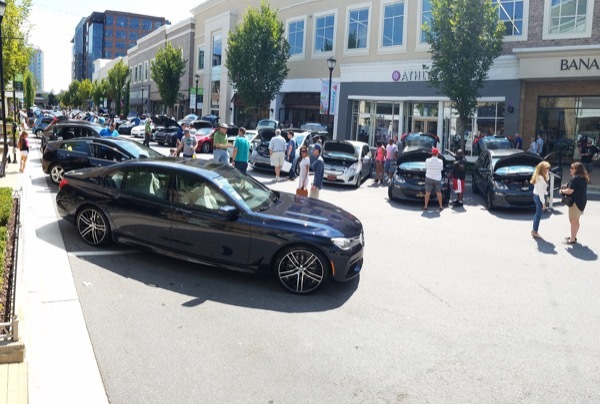 © 2017 MASS DRIVE CLEAN: permission is granted to use this photo to report, support or promote National Drive Electric Week events provided photo credit is given as shown above. All other uses prohibited unless written permission is granted by the owner. 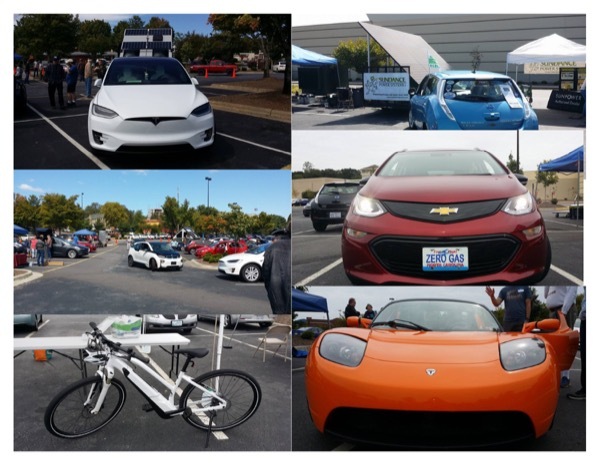 © 2017 R.Rubin: permission is granted to use this photo to report, support or promote National Drive Electric Week events provided photo credit is given as shown above. All other uses prohibited unless written permission is granted by the owner.